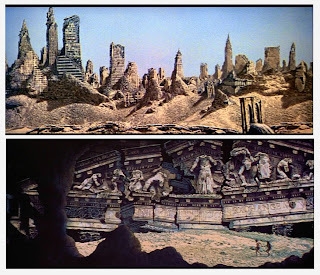 Matte Shot - a tribute to Golden Era special fx: A salute to the 20th Century Fox special photographic effects dept. 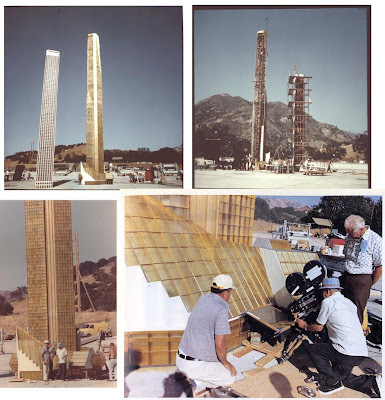 A salute to the 20th Century Fox special photographic effects dept. I've written much here in the past on selected effects films such as the amazing THE RAINS CAME and IN OLD CHICAGO among others, produced under the headship of the legendary special effects pioneer Fred Sersen at Darryl F.Zanuck's flagship 20th Century Fox. What follows is a photographic celebration of the creativity and inventiveness of the special photographic effects department at Fox from the twenties up into the seventies, by which time the effects department had closed and all such work was being farmed out to independent contractors and boutique effects houses. My earlier blogs contain a fair amount of biographical info on the key players in the Fox photo effects dept, though I will briefly highlight some of them again for those interested readers who may only now have stumbled across my blog, as appears to be the case frequently, based on the correspondence I receive. 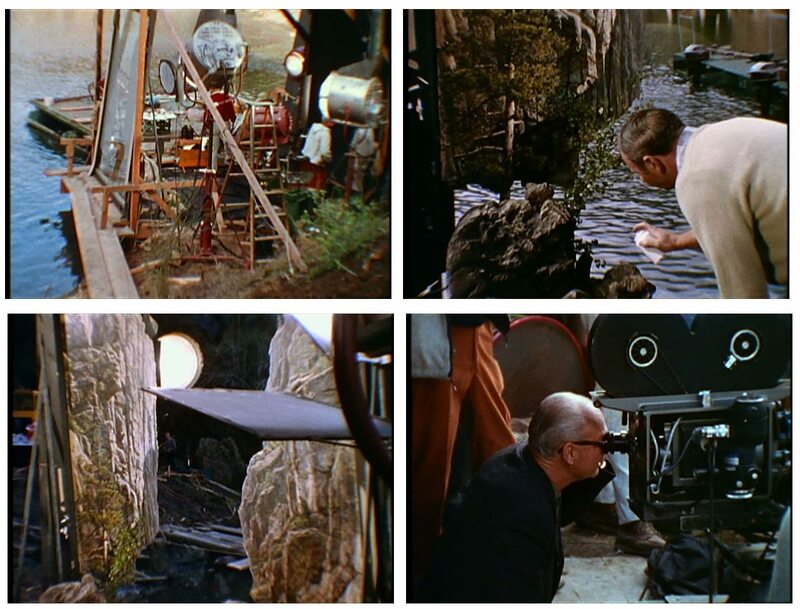 The matte and photographic effects department was for many years known as the scenic art department, and it was one of considerable size and wide ranging trick shot abilities. 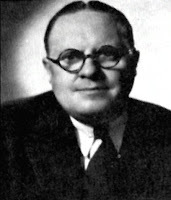 As with all of the Hollywood studios of the day, trick shots were invariably labelled under the surname of the head of that unit - Selznick Studio had Cosgrove shots, thus named after Jack Cosgrove; MGM's camera effects work was recognised under it's Newcombe shots banner after the eccentric Warren Newcombe; Universal's mercurial John P.Fulton would lead on to Fulton shots and so on - so it was too for Fox with it's brand name Sersen shots. Among the roster of talent under Sersen at Fox was his key associate and right hand man, Ray Kellogg. 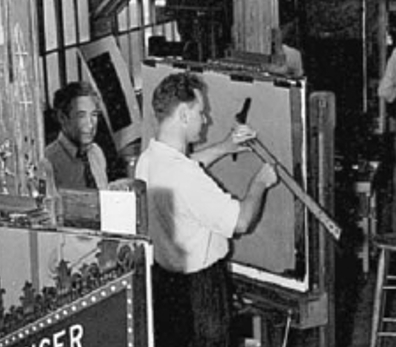 Like Fred, Ray was first and foremost a matte painter and would be principal painter on hundreds of films from the mid thirties right through to his assuming stewardship of the department upon Sersen's retirement in 1952. 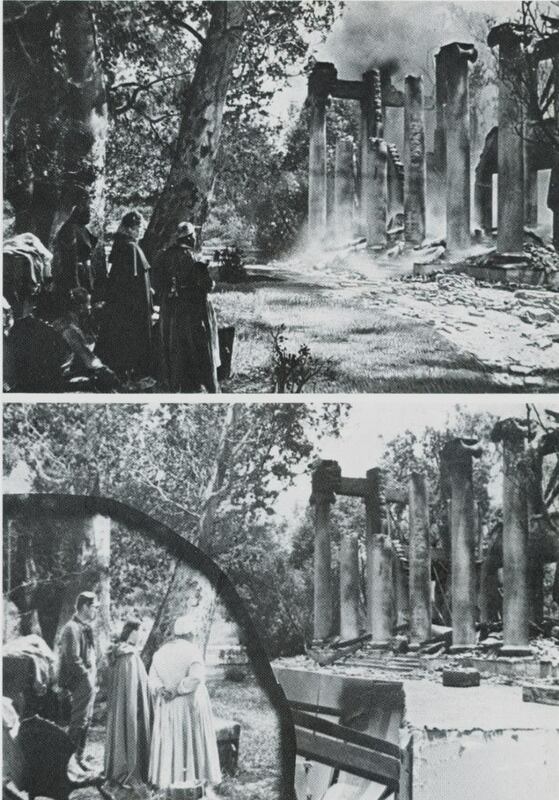 The photo at left shows Sersen (l) with Kellogg (r) during the filming of the big Oscar winning effects extravaganza THE RAINS CAME in 1938. 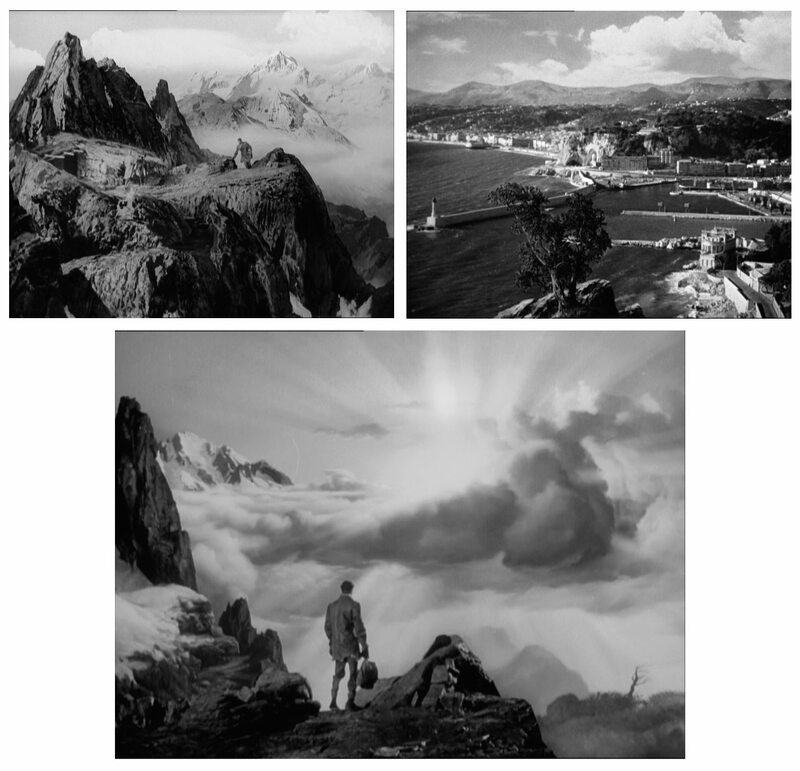 The photo at right shows Ray at work on a matte for an unknown film around 1951. 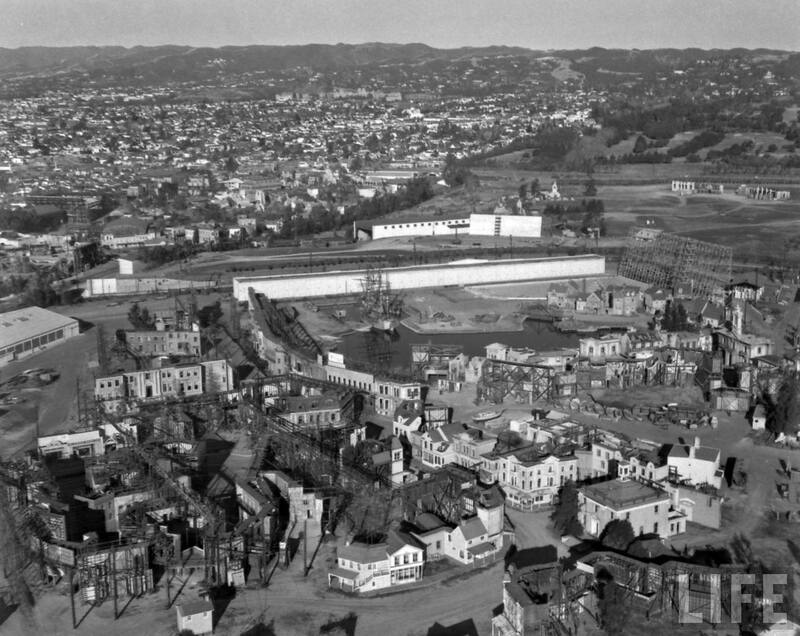 A partial view of the old 20th Century Fox backlot and according to Ed Nassour: "Here's a view of the vast Fox backlot in West LA circa 1940s showing the location of the original Serson tank at a time when the sky drop was being replaced which is why the scaffolding is showing. Next to it was the Chicago Lake. That long white structure was the scene dock. Behind it you can see a smaller sky drop which was constructed next to a mock-up of an aircraft carrier flight deck used in A WING AND A PRAYER. Behind that smaller backing was the huge train shed built for CENTENNIAL SUMMER". Many artists, cameramen, editors, art directors and niche specialists made up the Fox matte department, as the crowded group photo at the top of this blog will testify - though Fox wasn't the biggest by far, with Warner Brothers' huge Stage 5 Effects Stage of the 1940's probably taking the prize there. 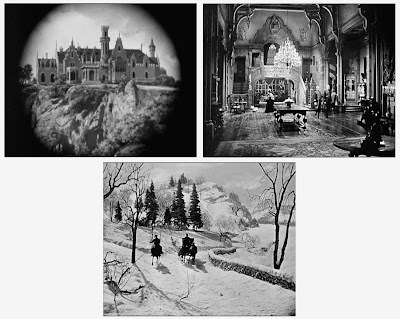 Among the names associated with the studio were pioneering visual effects cameraman and matte painter Ralph Hammeras - probably the most experienced of all in the field, even moreso than Sersen himself, and was regarded as one of the finest glass artists in the business. 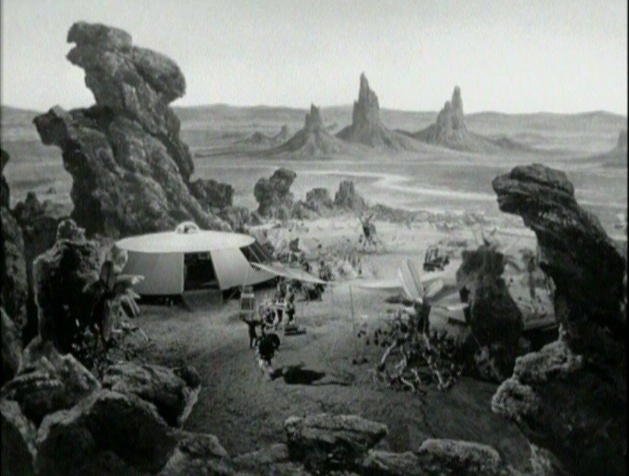 Hammeras would assume an important role in Fox productions for several decades, often adapting his skills from matte artist, effects cinematographer or miniatures supervisor as the need arose. 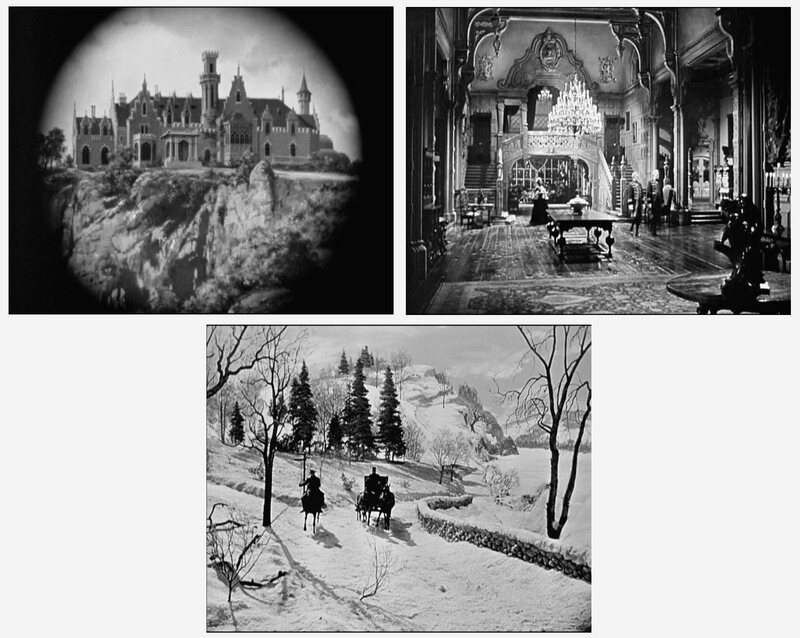 Among his work are wonderful riverboat miniatures in DRAGONWYCK, much special photography for JUST IMAGINE and what is arguably Fox's grandest effects film IN OLD CHICAGO. Emil Kosa senior painting gallery watercolours. Many matte artists would come and go from the studio over it's golden years, with the following names being just a few that I know of: The father and son team of Emil Kosa (jnr and snr) would be mainstays with Fox for much of their film industry lives, with Kosa snr also working in the Newcombe department at MGM for a time. Kosa snr was a self taught painter and would become mentor to many younger Fox glass artists. 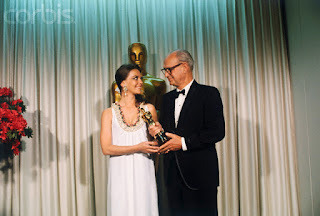 Emil Kosa junior began at Fox in 1933 and is widely credited as having designed the Fox searchlight logo. He worked for the studio for more than thirty years, won an Oscar for CLEOPATRA in 1962 and passed away shortly after completing the now iconic closing matte shot for PLANET OF THE APES. 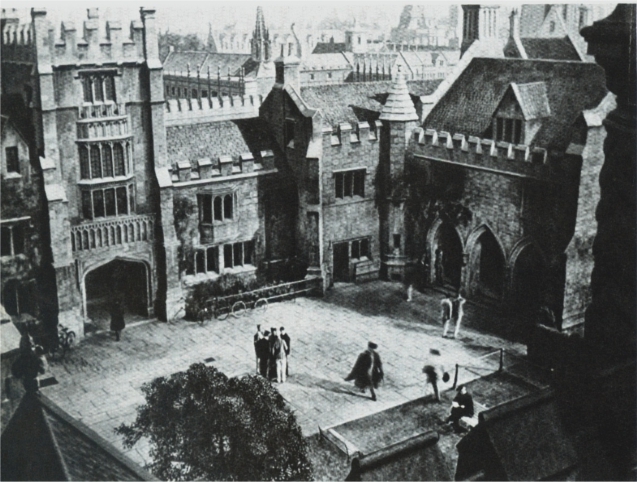 Additional names in the matte painting roster included Fitch Fulton - the painter father of genius Universal effects man John, who ironically tried all in his power to dissuade young John from entering the dodgy film industry in the late twenties, yet Fitch himself was coaxed into matte painting later on by his son, for such luminous matte heavy films as GONE WITH THE WIND and CITIZEN KANE. Fulton snr would be on staff at Fox for a number of years. 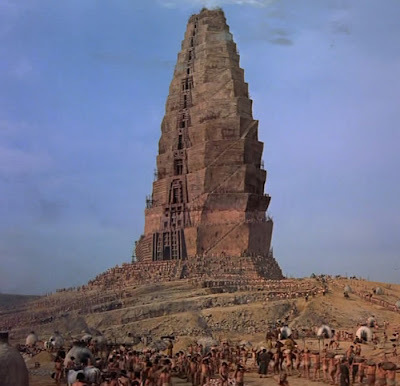 Other matte painters included Menrad von Muldorfer, who was with the studio for well over thirty years, from such films as THE RAINS CAME through to VON RYANS EXPRESS in the mid sixties. The only named screen credit I can recall was for the low budget Rabin-Block science fiction show KRONOS in the mid fifties. 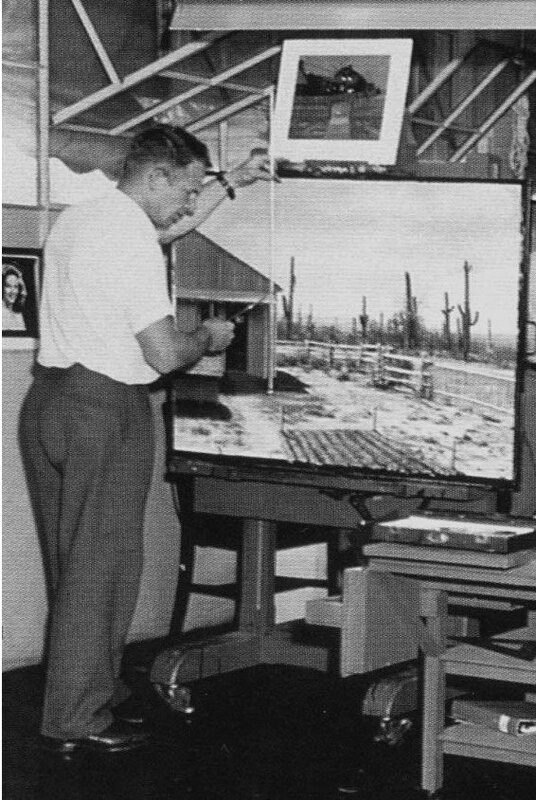 The 1938 unit photo at left shows von Muldorfer watching another un named Fox matte artist at work on the early stages of a matte painting. 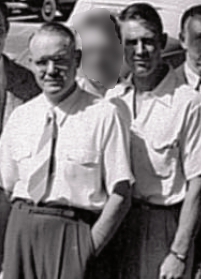 Max De Vega, Cliff Silsby, Gilbert Riswold, Clyde Scott, Hector Serbaroli, Joseph Serbaroli, Lee LeBlanc, Jim Fetherolf, Matthew Yuricich, Irving Block, Jan Domela and maybe Louis Litchtenfield were some of the other matte artists who featured anonymously and unrewarded throughout the golden years. Visual effects cinematographers would list several notable contributors to the artform of trick shots. Charles G. Clarke, James B.Gordon, Al Irving, Til Gabbani, Paul Mohn, Harry Dawe, Wally Castle, L.B Abbott , Sol Halperin , Frank van Der Veer, Art Cruickshank and Clarence Slifer among them. The photo at right (l to r) shows effects editor Wally White, head of dept Ray Kellogg, manager Bud Fisher and effects cameraman Al Irving with one of the large 3 strip technicolor cameras. Visual effects cameraman and future head of the Fox trick department Lenwood Ballard Abbott, better known as 'L.B' or just plain Bill would prove himself to be a prominent force in the visual effects community was a true mainstay with the studio, and dedicated virtually his entire career to Fox. I hope to run a one off blog on Bill Abbott in the future as I've had contact from one of his staffers from the sixties, so I'm hopeful things will eventuate. In the meantime here's a bit of a rundown on Bill: he started as an assistant cameraman in 1926 on Raoul Walsh's WHAT PRICE GLORY and would move up through the ranks and into Sersen's trick department, with his first true special effects camera duties on the thrilling effects shots for IN OLD CHICAGO in 1938. 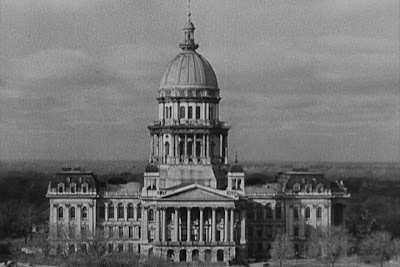 After a brief sideways move back into production camera operation, Abbott resumed effects work as director of photography for the effects department in 1943 where he would remain until assuming the headship of the unit upon Ray Kellogg's departure in 1957. In Abbott's excellent memoir, Special Effects - Wire, Tape and Rubber Band Style, he outlined the working methods of the Fox effects stage in the sixties: "For a period of about three years we were producing 10 hours of tv a week and some 25 features a year. Our personnel averaged 40 people. The amount of equipment we utilised was impressive. 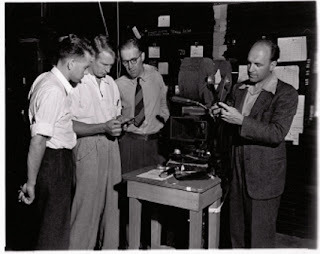 There were two 65mm optical printers and one 65mm matte camera; two Producer's Service triple head optical printers and three of their bench printers; three 35mm matte shot cameras, one home built scanning printer used to convert CinemaScope to flat television format; one Producer's Service contact printer used exclusively for the manufacture of separations for colour duping; a home built optical printer with a long bed used mainly for the conversion of flat to scope or vice versa; one vertical animation stand and two horizontal stands; four Mitchell high speed cameras with register pins in the viewing tube to allow for the use of film clips for lineup, and two Houston developing machines". 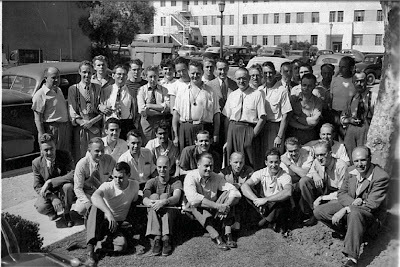 Fred Sersen (centre) supervising in camera glass shots on the Fox lot. In describing the actual special effects stage, Abbott wrote: "The dept. was housed in a building with the art dept. and the backing dept. Our area was approximately 350 feet by 80 feet. We had a stage 60 x 40 feet with a 16 foot ceiling. The stage was in constant use for shooting miniatures, inserts and odd jobs"
The excellent 1935 version of LES MISERABLES was a beautifully told piece, augmented with minimal mattes. Shirley Temple's 1937 hit HEIDI looked okay in original black and white, but avoid at all costs the abominable computer coloured version. 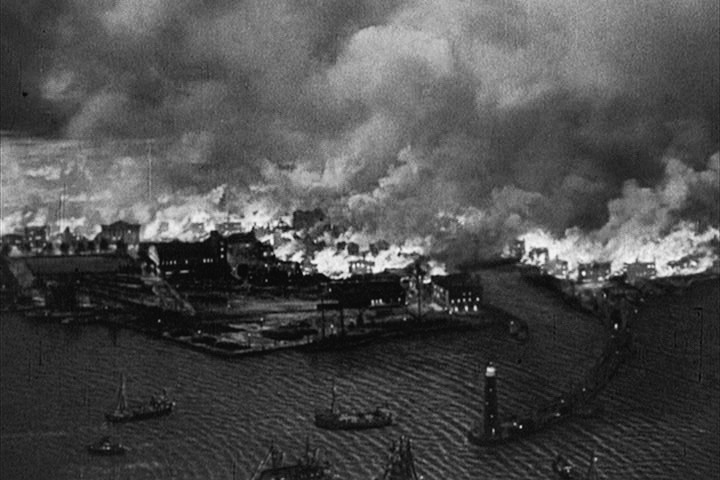 The phenomenal, jaw dropping visual effects from IN OLD CHICAGO (1938) which feature the best ever scenes of flaming inferno ever lensed in my book!! Amazing stuff which still holds up today some 74 years later. 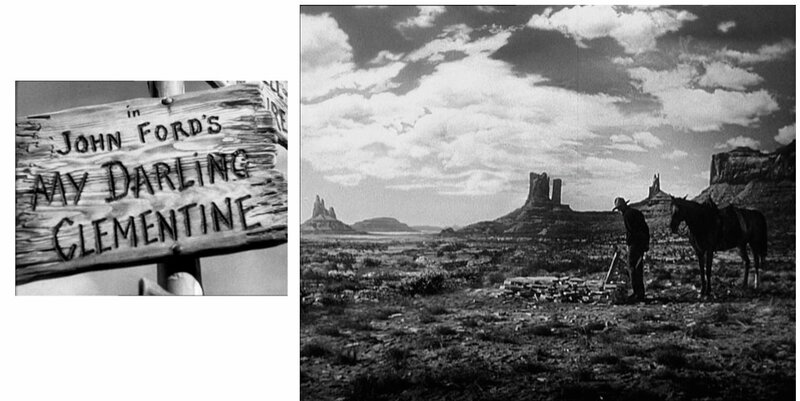 This shot turned up elsewhere later on, such as the James Stewart thriller CALL NORTHSIDE 777. IN OLD CHICAGO.... for more, see my blog dedicated to this film. The brilliant 1943 Henry Fonda film THE OX BOW INCIDENT featured this curious matte split screen where the coachman's head is momentarily 'chopped off' by the matte line. 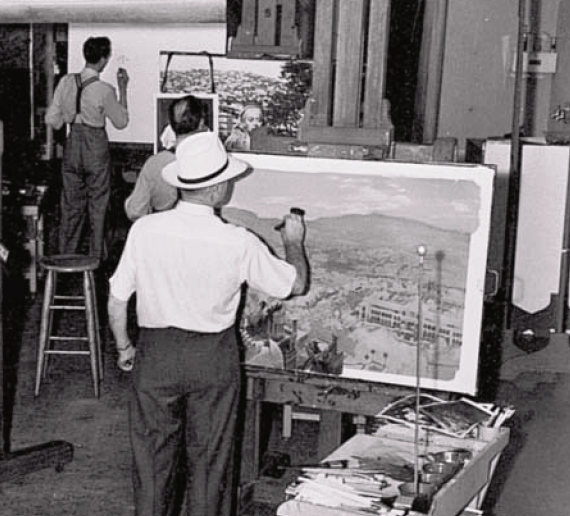 Matte artist Hector Serbaroli at work on one of the mattes for THE RAINS CAME (1939). For more on this film check out my special blog on it a few months back in the sidebar. 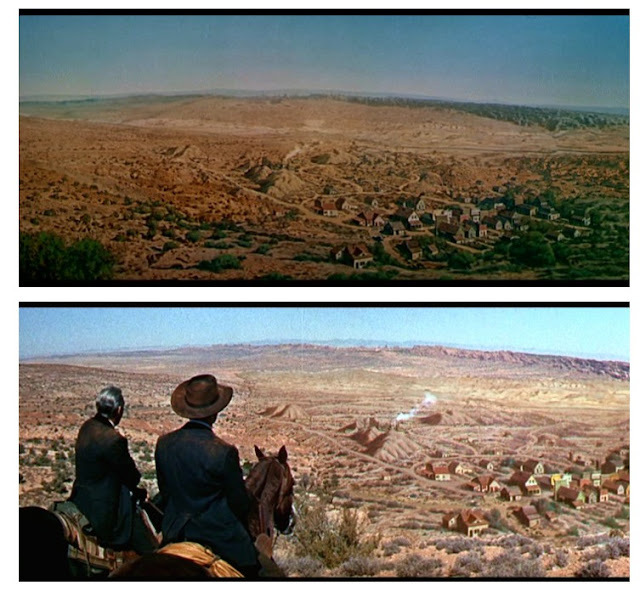 Gene Tierney's 1941 programmer BELLE STARR featured this Ralph Hammeras photographic effect which involved live action, miniature and linking matte painting to tie it all together. A very subtle blend brings together a limited set on the right side of the frame with a matte painted view of Monument Valley and the sky on the left hand side of the frame for MY DARLING CLEMENTINE (1946). The join is a well disguised, irregularly drawn soft blend that Henry Fonda almost rides his horse through as the shot cuts away. 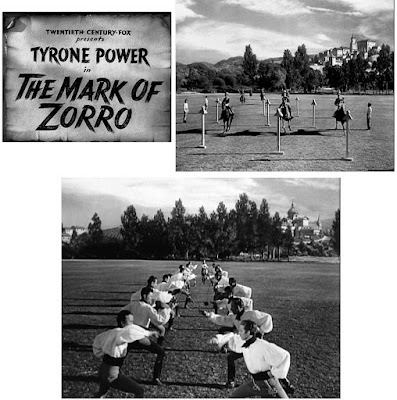 Several painted mattes open THE MARK OF ZORRO (1940) depicting period Madrid. 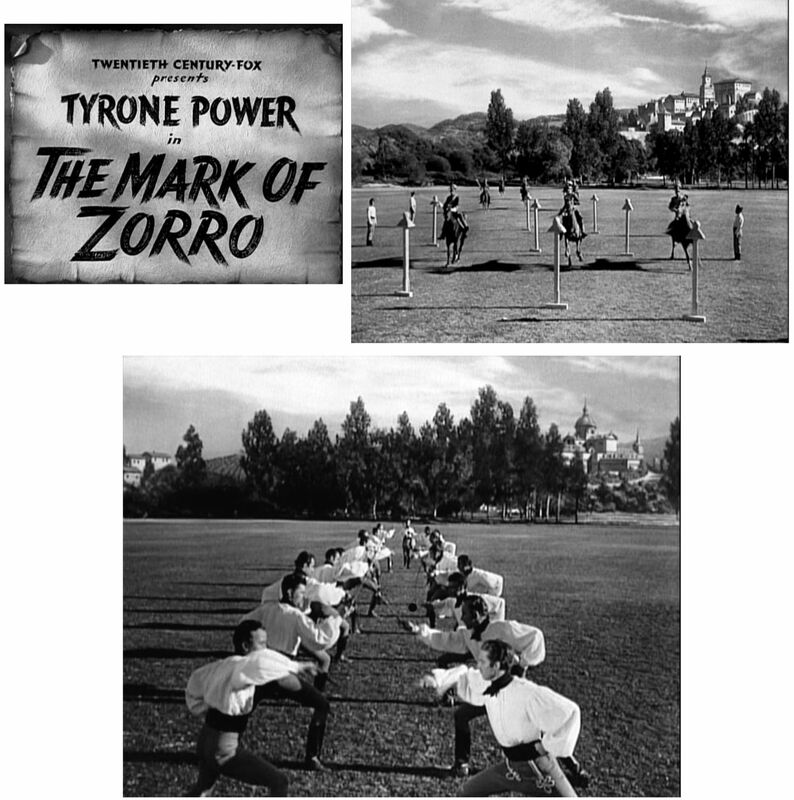 More from THE MARK OF ZORRO. 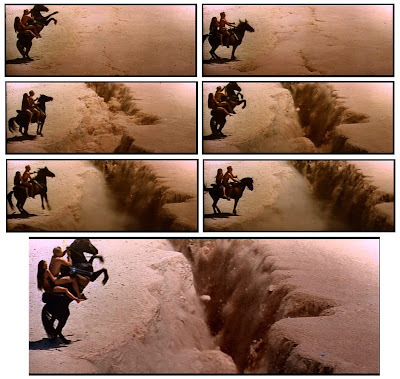 Aside from these glass shots the film had several clever optical combination gags such as rotoscoping for a dramatic and dangerous looking horse jump from a bridge into a river, and some swordsmanship enhancement optical work. 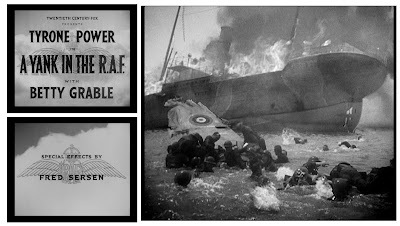 Not a film one anticipates as an effects show, but there are a number of Sersen effects shots in the excellent LIFEBOAT (1944). 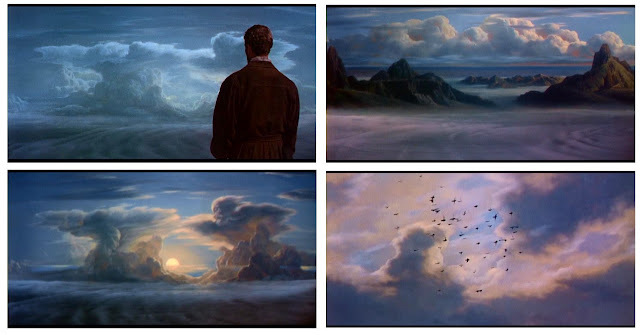 Some matted in painted skies and several excellent miniature-live action split screens (above left) which are terrific. 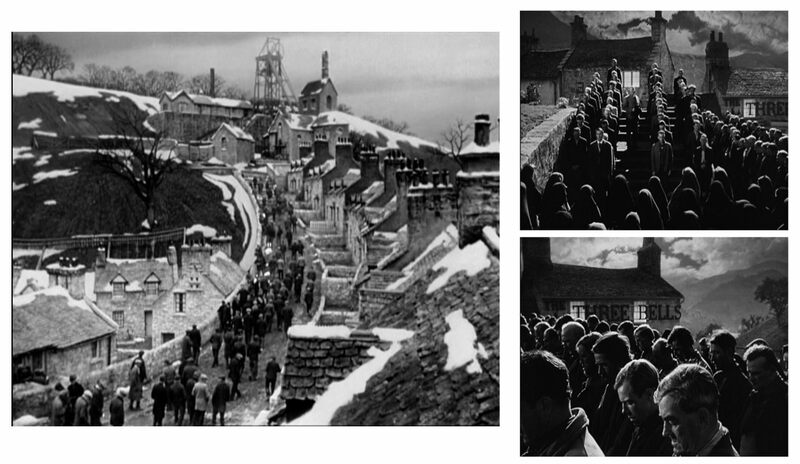 More process-miniature combination set ups from LIFEBOAT, with Sersens fx storyboards shown here too. For years, Sol Halperin was in charge of Fox's process photography, much as Farciot Edouart was at Paramount, and these pictures show the technique at work in LIFEBOAT. 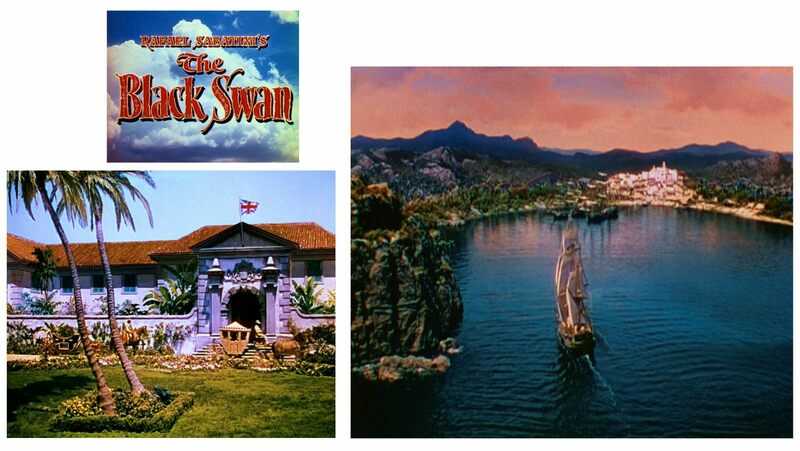 Tyrone Power's big 1942 swashbuckler THE BLACK SWAN was an excellent (and gorgeous looking) technicolor adventure with nice matte art and many excellent seagoing miniatures, some of which was re-used in subsequent pirate shows. 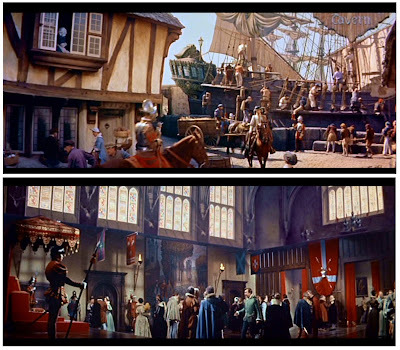 Sensational model work from THE BLACK SWAN shot in the Sersen tank, coupled with astonishingly well executed opticals with people added to the decks and even the mast of the ship by means of complex travelling matte - a trick that Sersen would repeat in other later films to equally good effect. 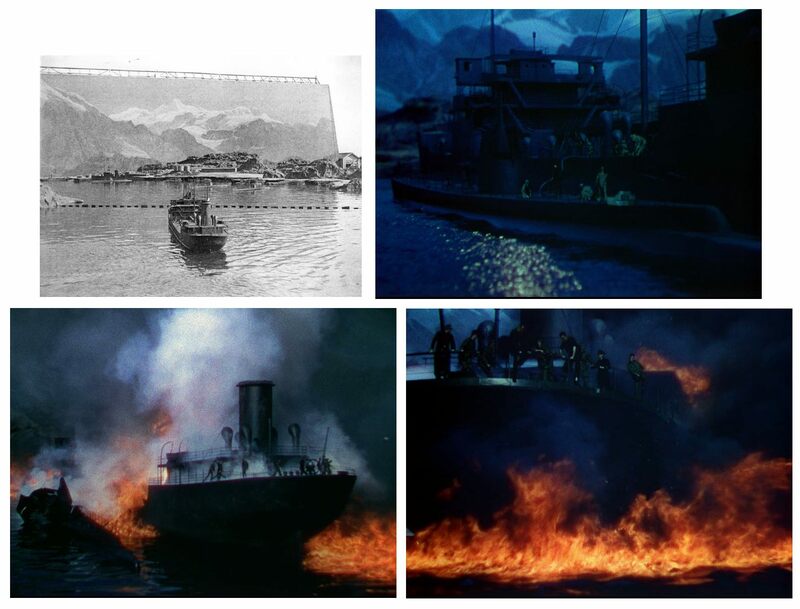 Fred Sersen won the Oscar for his effects in CRASH DIVE (1943) - a film with alot of the aforementioned travelling matte work to insert actors onto burning miniature destroyers - all most effectively. 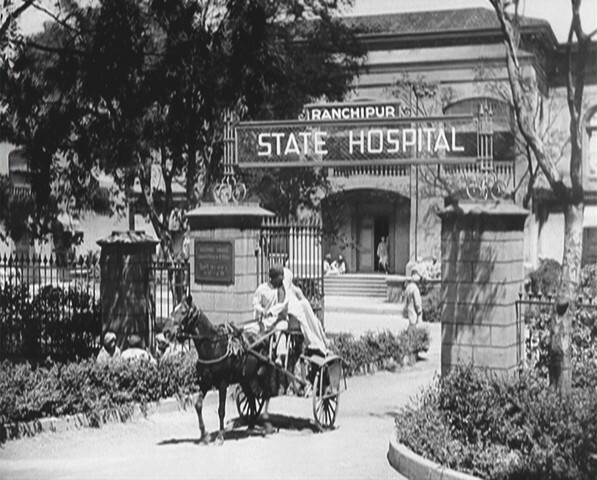 The upper left matte is an utterly invisible composite which adds the tree, top of the gateway, sign etc. 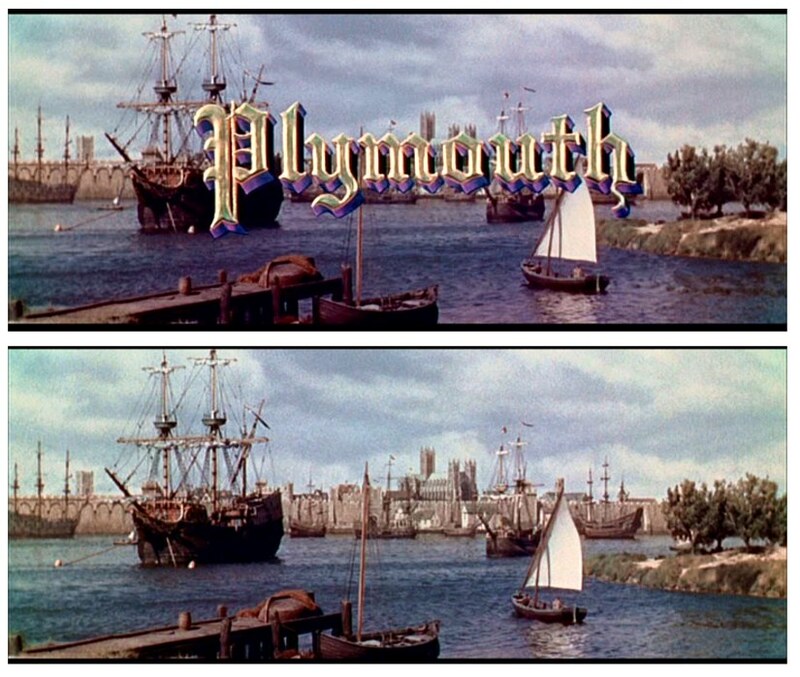 The matte on the right looks suspiciously like the original film elements were faulty in colour timing, possibly during the telecine remastering for DVD etc. Some great frames from CRASH DIVE demonstrating the extensive use of travelling matted actors with model ships. Some of the big conflagration scenes in CRASH DIVE also comprise actors safely matted against miniatures and matte paintings, with separate fire elements added. 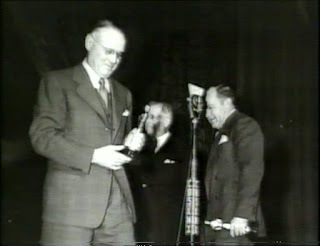 And here is Sersen picking up his Oscar with sound department head Roger Heman also recieving for audio fx. 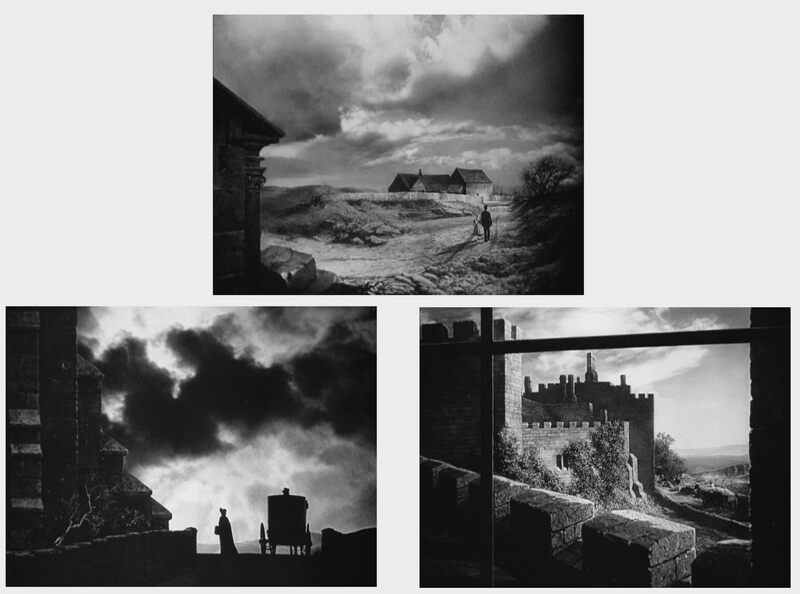 The 1947 gothic melodrama DRAGONWYCK had alot of effects work, such as this not entirely effective painting of the cityscape, where perspective issues are numerous. 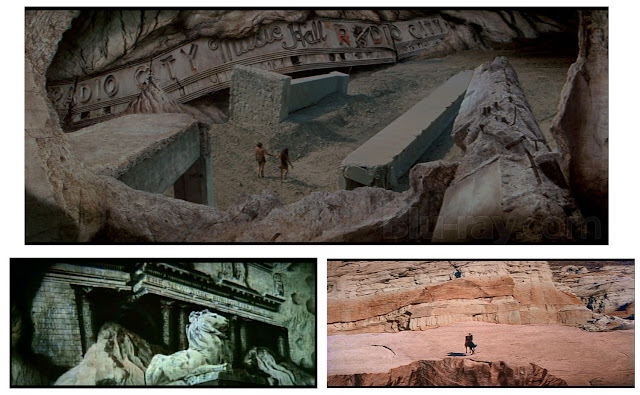 The shot at right is an uncredited Ralph Hammeras miniature. 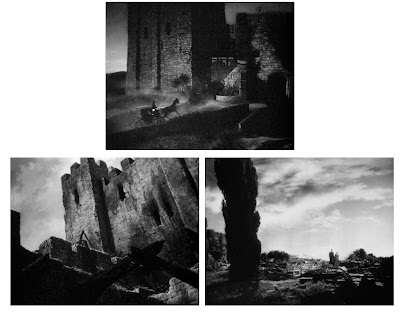 Two more mattes from DRAGONWYCK.. I'm a sucker for creepy 'haunted house' style matte shots. Edward Nassour recently told me the following about the Sersen tank: "The Serson Tank was originally on the Fox lot in West LA at what is now Century City. 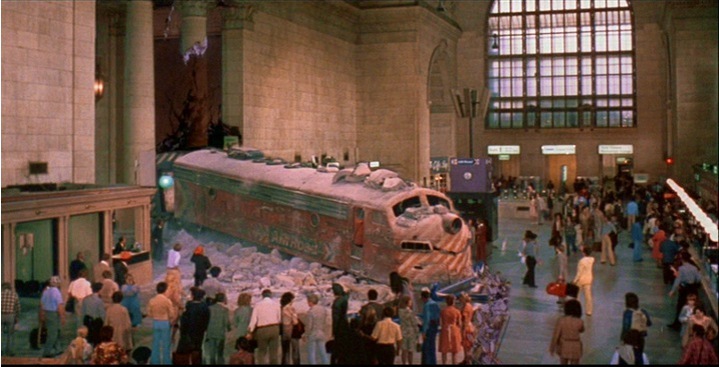 It remained there until it was dismantled after the vast backlot was sold to Alcoa. That was back in 1961. A brand new Serson Tank was constructed out at Fox's ranch in Malibu Canyon. It was built sometime in 1962 and first used for CLEOPATRA. Today a parking lot marks the spot where it was located. 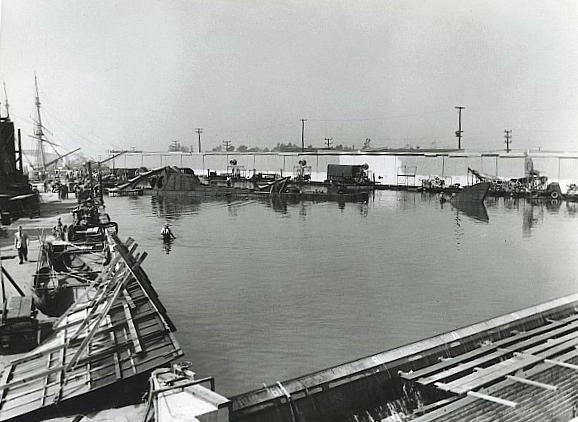 This is a photo showing the original Serson Tank with its sky backing on the Fox lot. 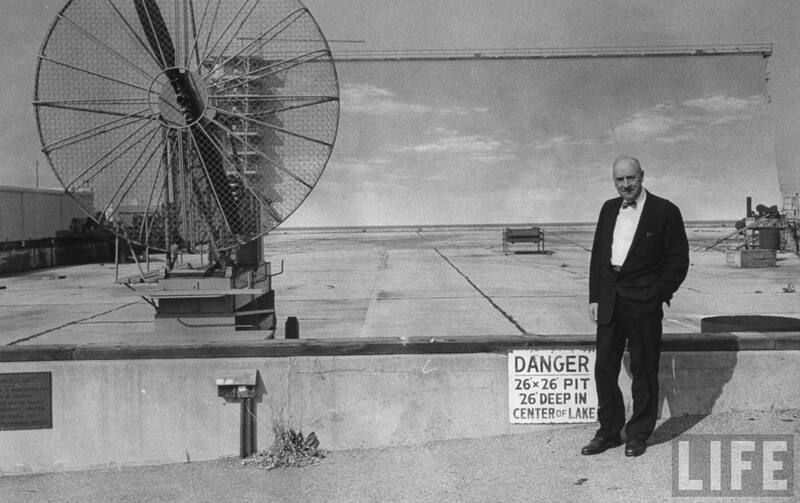 That's Joseph Welch standing in front of it". Another view of the Sersen tank at Fox, and by the looks of this photo Disney (who didn't have a tank) were in the midst of shooting the full scale submarine shots for 20'000 LEAGUES UNDER THE SEA (1954). Not only did Disney use the Fox tank, but also the big and bulky Fox owned Bausch and Lomb anamorphic lenses to shoot in scope. a good view of the size of the backing used in the Sersen tank. Ernst Lubitsch's classic HEAVEN CAN WAIT (1943). 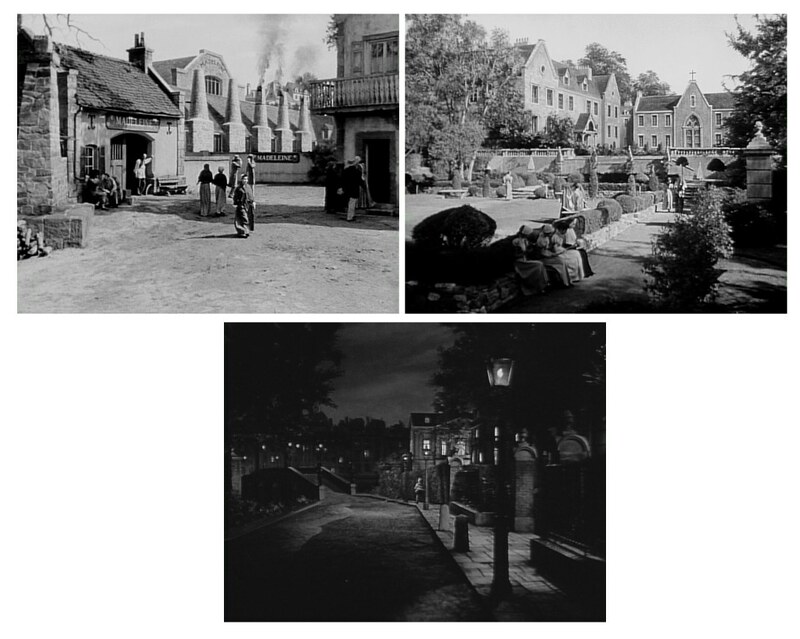 The 3 frames below left are mattes of the same street through different time periods in the film. 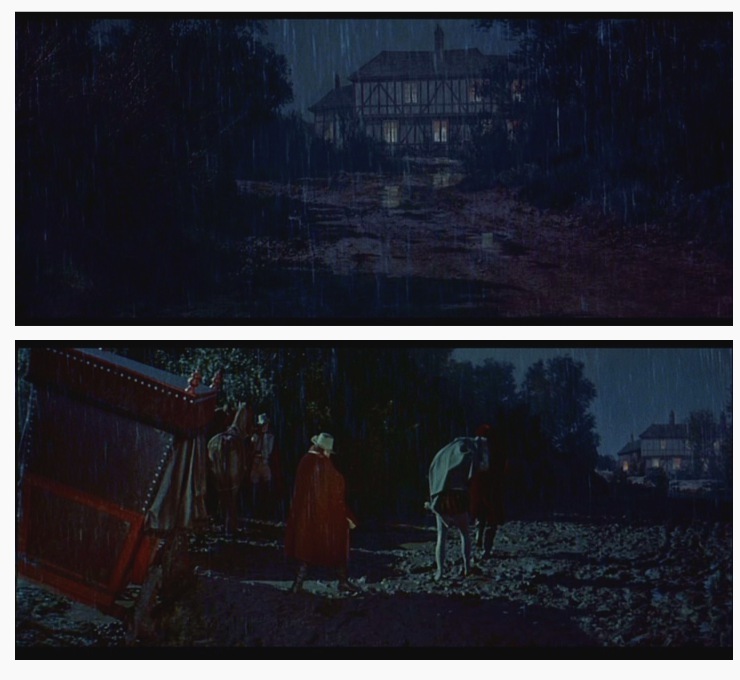 The middle frame was later used by Universal for the John Astin tv movie EVIL ROY SLADE (1972), which oddly, had mattes credited to Albert Whitlock!! Lubitch's idea of 'Hell' as in HEAVEN CAN WAIT. 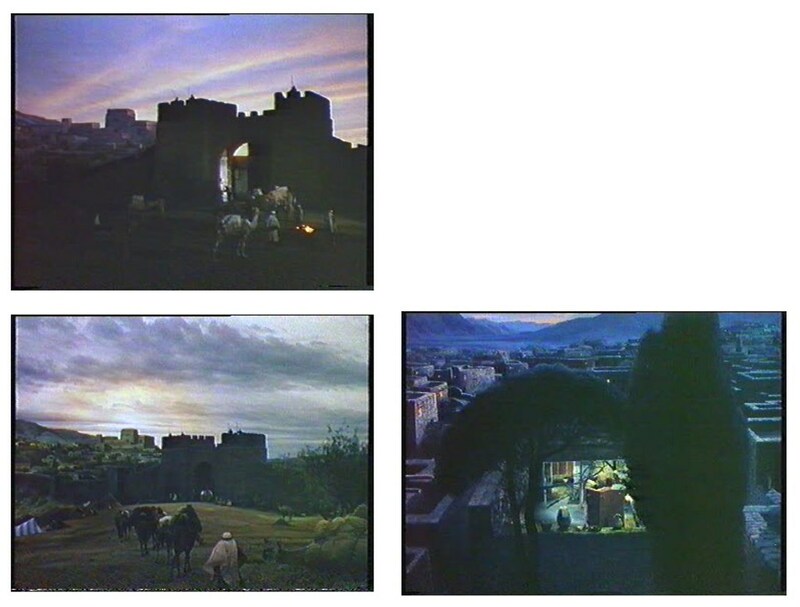 John Ford's HOW GREEN WAS MY VALLEY (1941) used painted mattes in several shots to try to disguise an otherwise tired and obvious Fox Ranch shoot, which in no way imaginable would pass for Wales. Some wonderful skies added via soft blend splits, often barely above the heads of the actors at times. 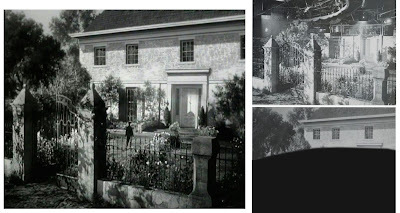 An invisible Ralph Hammeras matte from HOW GREEN WAS MY VALLEY - the kind so prevalent throughout the thirties and forties where significant architectural detail is added by the matte artist without the audience ever being any the wiser. Orson Welles' brooding 1944 version of JANE EYRE is a sumptuous, richly textured gothic love story. 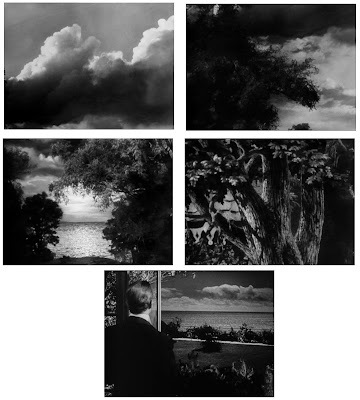 Sequential frames from a complex optical jigsaw which opens the Tyrone Power film THE RAZOR'S EDGE (1946) where the camera starts on a painted sky and moves on down through trees, pans across a multi plane type ocean behind bushes and into the porch of the actor - in one cleverly assembled continuous move. The Sersen department's mattes were nominated for best special effects for WILSON (1940). 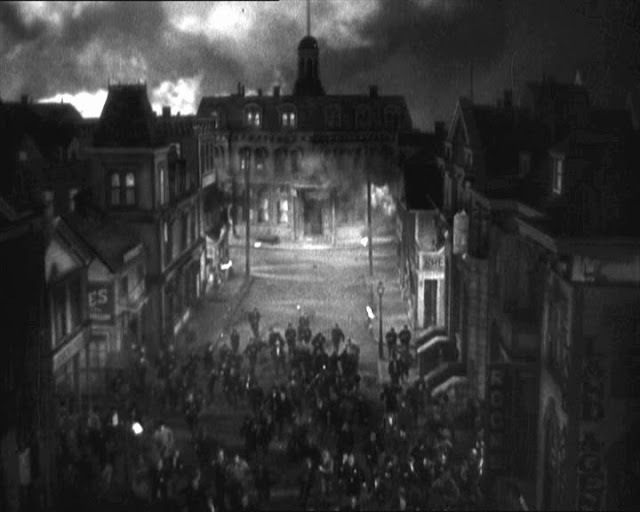 Another of the numerous Oscar nominated Fox effects films, A YANK IN THE R.A.F (1941) which had excellent effects work throughout, with this shot looking to me like a matte painting or model split screened with actors in a tank with a fire element and drifting smoke doubled over the top. 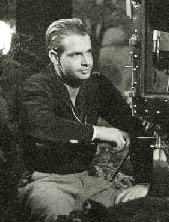 Ralph Hammeras was heavily involved with the effects work on this. Ray Kellogg matte shots from A YANK IN THE R.A.F, nicely finished with doubled in explosion elements, aircraft dive bombing, smoke, fire and lots of pockets of live action. 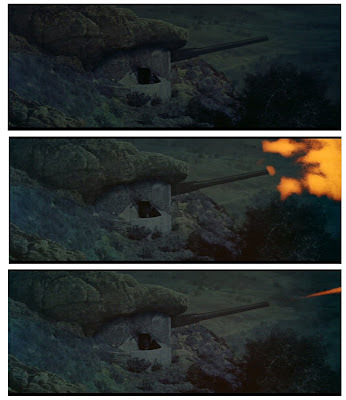 Same film, some of the really good bomb run sequences with animated searchlights and much else to help sell the effect. 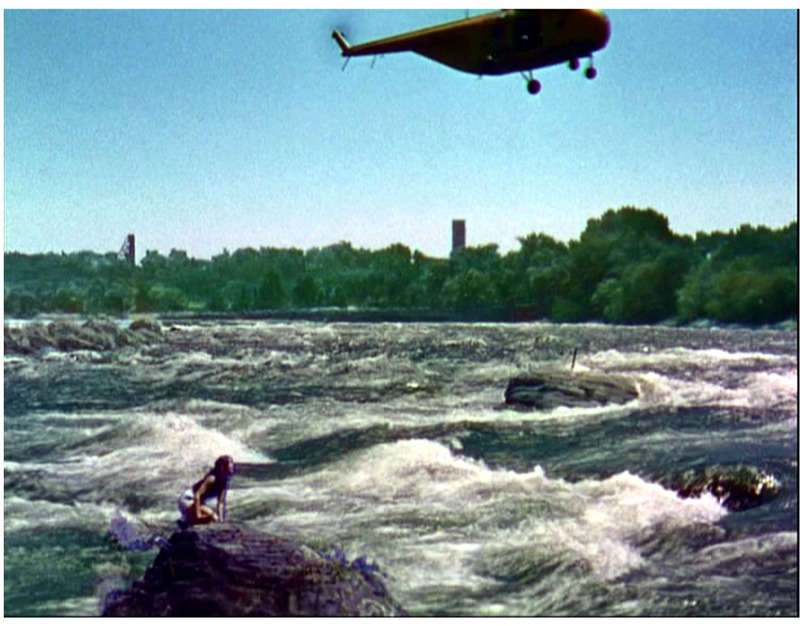 Classic Hollywood wartime miniature shot - also from A WING AND A PRAYER. 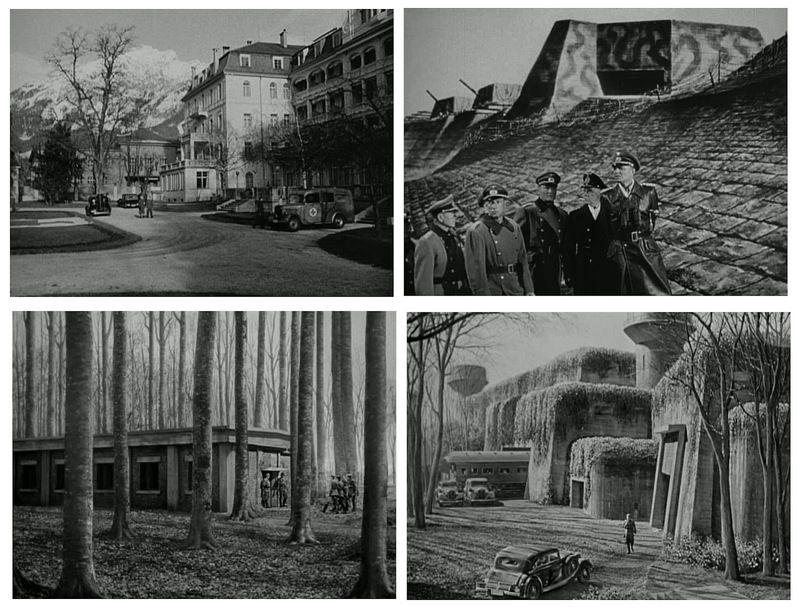 A true masterpiece of the genre - quite a few matte shots here with some where you'd least expect them. 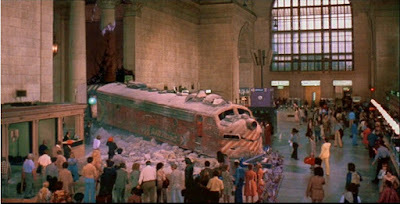 The Times Square shot for example, upon close inspection, shows all the vehicles to be painted and matted in in sections - a trick used sevferal times in the film during the international 'time freeze' set piece'. I've said it before and I'll say it again, music maketh the matte, and the great Bernard Herrmann has rarely bettered himself outside of this sensational score. Also from THE DAY THE EARTH STOOD STILL (1951). Note the painted traffic at a stand still. The very dull Gregory Peck in an equally dull biblical picture, DAVID AND BATHSHEBA (1951). DAVID AND BATHSHEBA - An interesting and convincing effect from an otherwise uninteresting film - what I presume to be a nodal head pan across a foreground painting or miniature city (almost certainly the former). The 1952 remake of LES MISERABLES had Ray Kellogg supervising mattes . 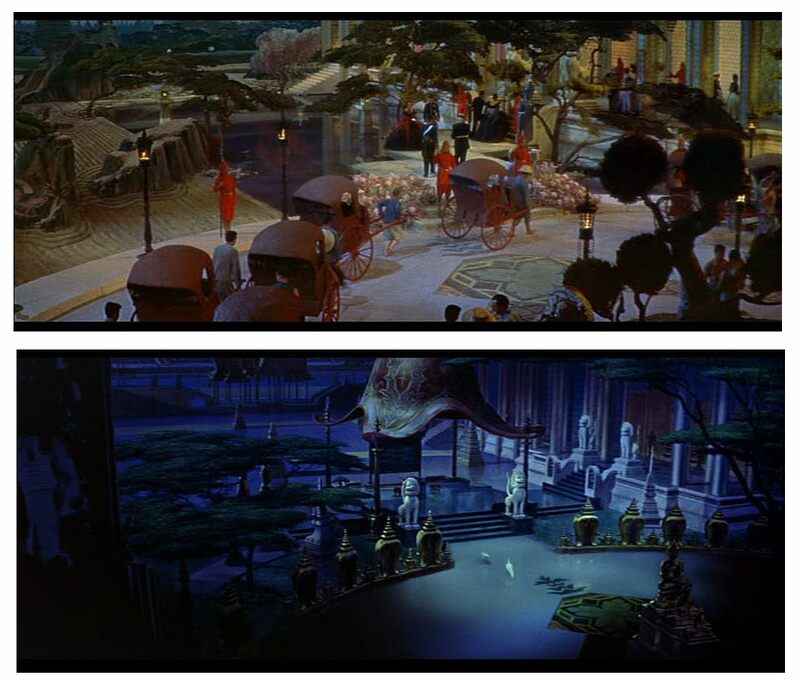 The mattes are quite nice though the film isn't a patch on the 1935 version. Three more matte shots from the 1952 version of LES MISERABLES. 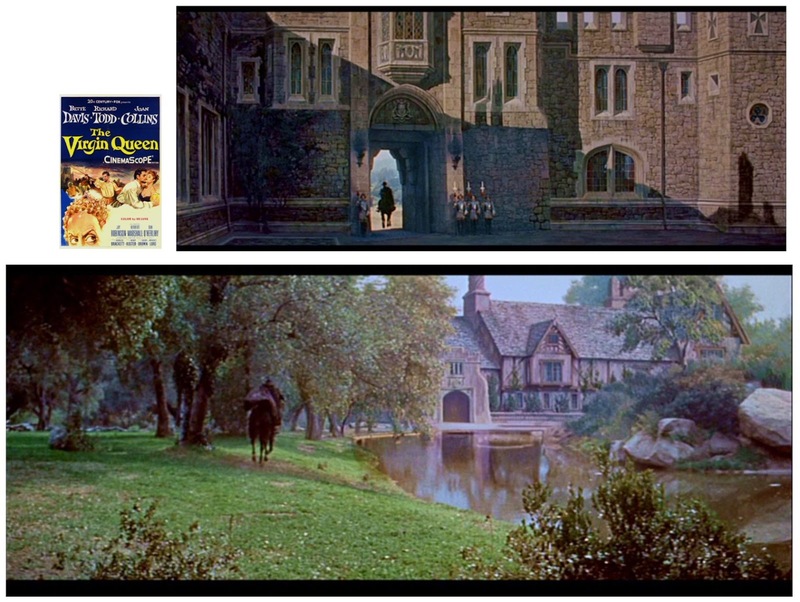 Rather good matte composite from ANNE OF THE INDIES (1952) which also re-used mattes from THE BLACK SWAN. The three mattes seen in the Clifton Webb version of TITANIC (1952). Gene Tierney's 1945 picture LEAVE HER TO HEAVEN had these mattes with a particularly good one top right with the painted country club beautifully sandwiched into an actual setting. 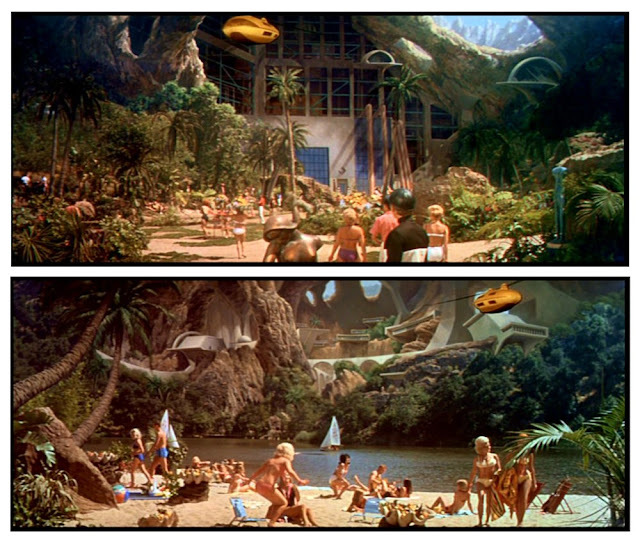 The lower left looks like a matte art split screened with a waterfall, and this in turn process projected behind Cornel Wilde. Marilyn Monroe rarely looked as hot as she did in NIAGARA (1953). These shots are from the murder sequence in the bell tower where the masses of bells have been painted in for both the downview and the tilt up shot. Now these are really good in motion, also from NIAGARA, we get a series of great shots where the heroine's boat is loose in the rapids and ready to go over the falls in what appears to be a brilliantly matted together composite of the real locale with a barely detectable soft split adding the boat in, most probably, the studio tank. Neat stuff and quite bold I thought. The other frames are very effective rear screen shots, which in motion are quite thrilling. Also from NIAGARA - a multiple component effects shot. 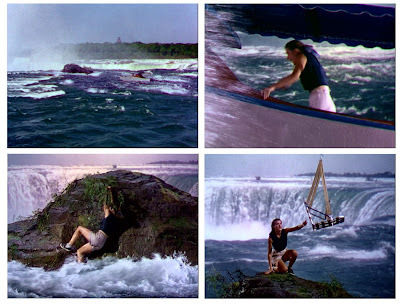 Jean Peters clings to fake rock in front of bluescreen, raging rapids footage split screened with painted horizon, and a separately matted in sky with helicopter coming to the rescue. Another dull film with a dull actor - Gregory Peck again.... a major 1952 yawnfest. I've always loved that full Fox Alfred Newman fanfare (almost as much as the Max Steiner Warner Bros fanfare) especially when the CinemaScope logo is included..... 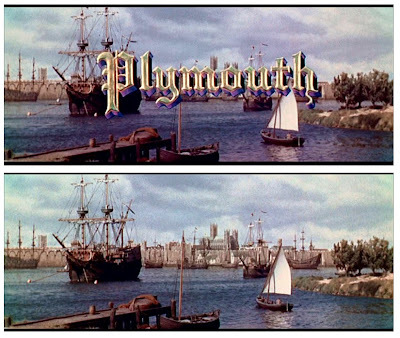 The process came into widespread use via Fox in 1954 and the studio never looked back, with virtually all subsequent films being shot in the new widescreen process. 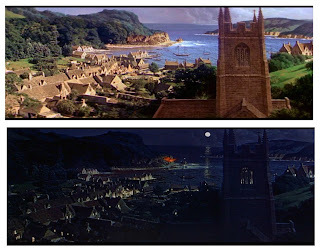 As good as it may have looked on the big screen (and it did) the process was a pain for cinematographers, editors and especially photographic effects men who had to contend with unforgiving levels of distortion and odd compression artifacts at the outer edges of the screen, which is still visible in older films. 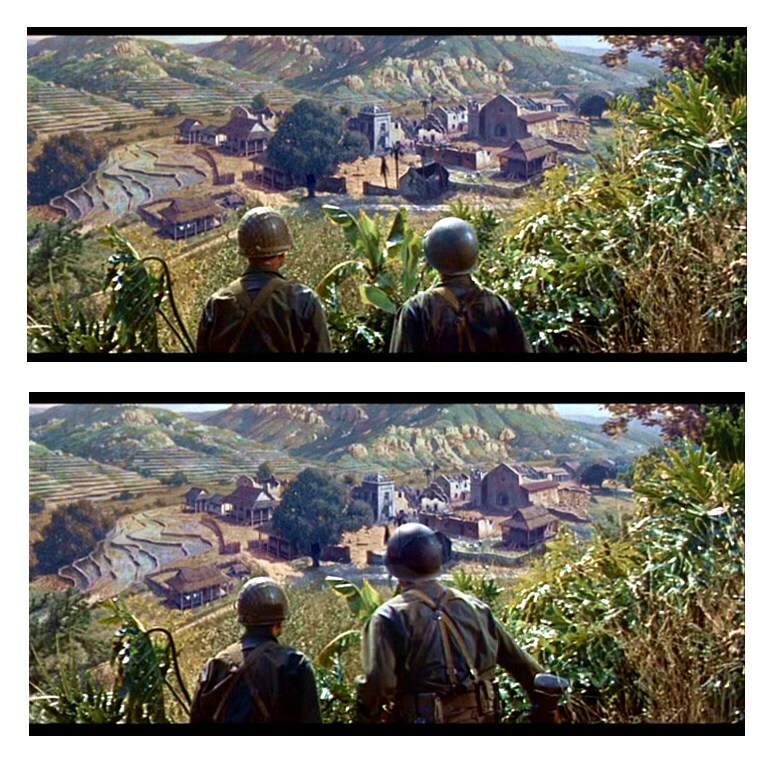 Shooting and compositing mattes was fraught with problems, mostly with focal depth when shooting static art. Matthew Yuricich was one noted painter who learned to master the art of painting to anamorphic, by designing and constructing his mattes to compensate for these anomalies. Fox's big premier CinemaScope film was THE ROBE (1954) - and several grand mattes certainly livened up the affair. 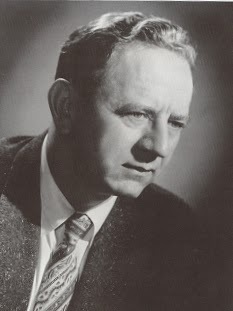 Matthew Yuricich was one of the painters on this film, along with Emil Kosa jr and others. 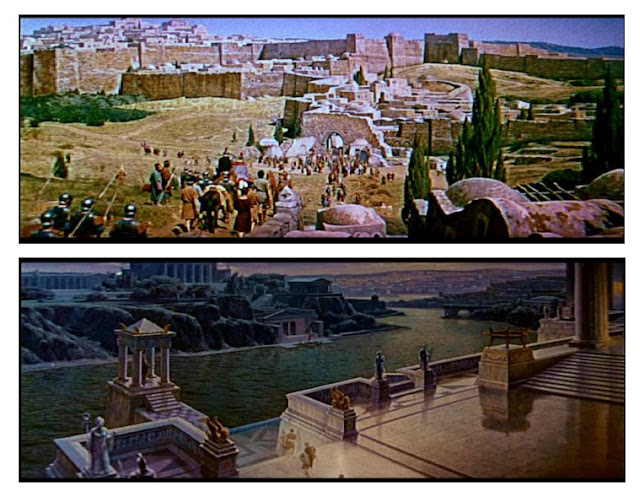 The lower matte of the river Tiber and the steps of the palace was recycled for the sequel. A matte from the dire sequel DEMETRIUS AND THE GLADIATORS (1954) which is actually one of those from THE ROBE, though this time printed down and enhanced to give a night time effect. 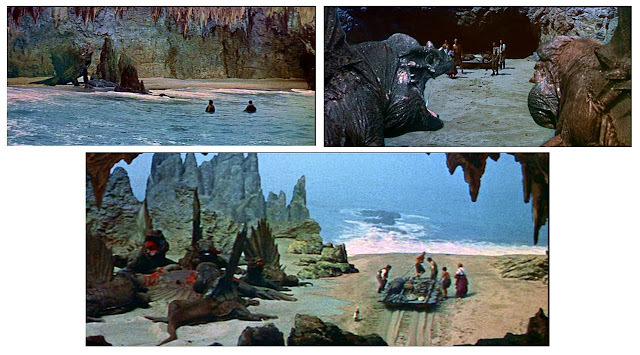 Jules Verne's marvellous story JOURNEY TO THE CENTRE OF THE EARTH (1959) was a joy to watch, and a grand entertainment at that. Many, many effects shots just sweetened the deal for the audience. By now L.B Abbott was in charge, though many of the same artists and cameramen remained. 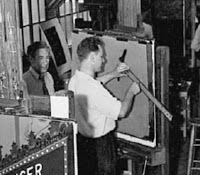 Emil Kosa jr and Ralph Hammeras were principal matte painters, while James B.Gordon and Walter Castle were effects cameramen. The film was nominated in the visual effects category though it lost to BEN HUR that year. Although they were mere lizards, I recall being utterly enthralled by them on screen as a kid as they were just so 'real'. 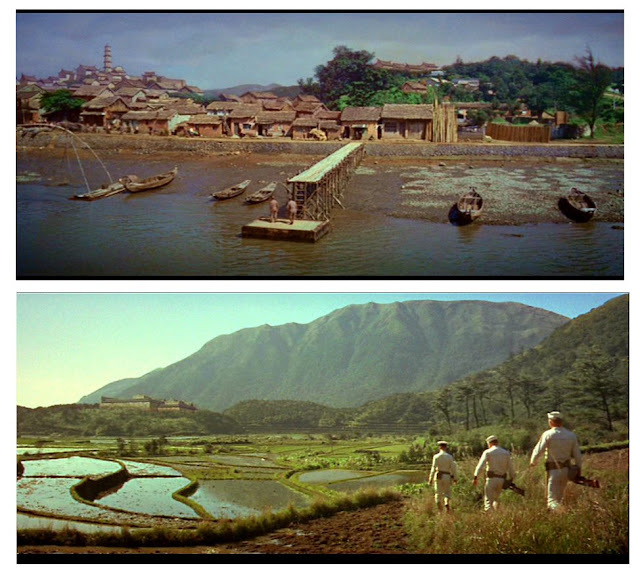 Some nice split screen work here tying together miniature sets, location and matte art extensions. All from JOURNEY TO THE CENTRE OF THE EARTH. Once again the maestro Bernard Herrmann came to the party with a unique one of a kind score. 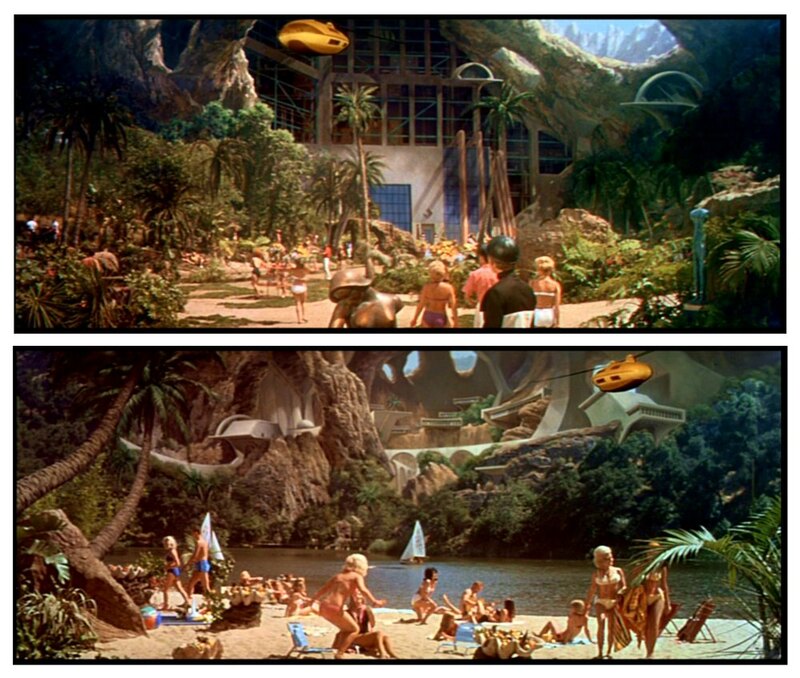 The grotto - matte shot from JOURNEY TO THE CENTRE OF THE EARTH. I was in touch a while back with a fellow who said he owned some of these original paintings and was going to let me see them, but sadly nothing came of it. 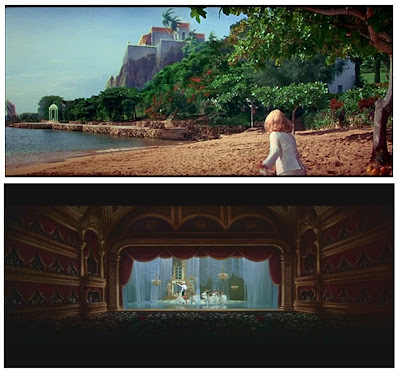 Beautiful miniatures of period Bangkok and a paddle steamer open the film. Effects supervisor Ray Kellogg. The taut Yakuza thriller HOUSE OF BAMBOO (1955) used matte art to present post war Tokyo (1955). Several effects shots expand the vision of John Huston for HEAVEN KNOWS MR ALLISON (1957) such as squadrons of Japanese zeros in one shot and two views of distant ships off the bay. 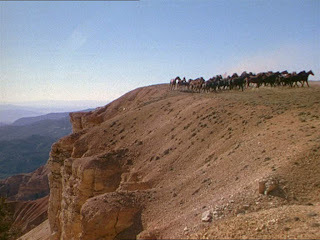 Gary Cooper's 1954 western, with a great title by the way, GARDEN OF EVIL has heaps of matte shots in it such as this sweeping vista of a harbour and landscape as well as many shots of mountain passes and canyons, some added in to suggest more treacherous riding trails high on the cliff edge. 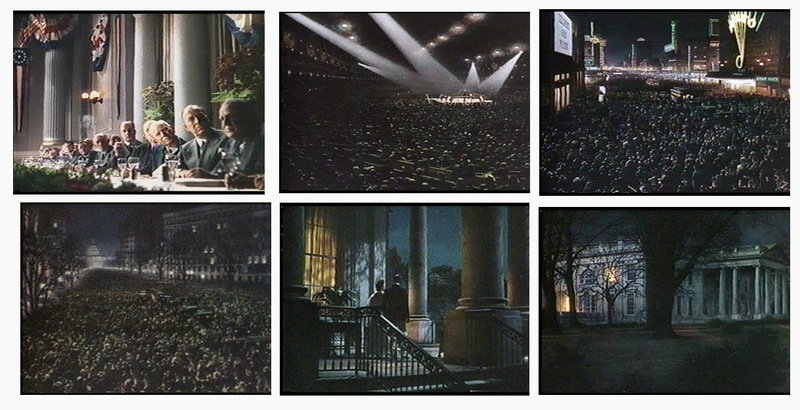 GARDEN OF EVIL again - and as with several of the shots differing painting styles tend to suggest multiple artists. Two more of the many mattes from GARDEN OF EVIL. 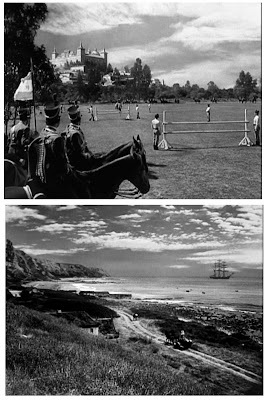 Robert Taylor's 1956 wartime love story D-DAY, THE SIXTH OF JUNE had many matte shots, including ships at sea, bombers over London and this facsimilie of the English seaside town, comprised mostly of artwork. The shadow of the vehicle vanishes under the matte line as it pulls up to the curb. Among the many effects shots in D-DAY, THE SIXTH OF JUNE are several of these wonderfully convincing and very bold trick set ups where the entire ack-ack styled heavy artillery gun is painted in and the muzzle flashes are brilliantly executed animation. 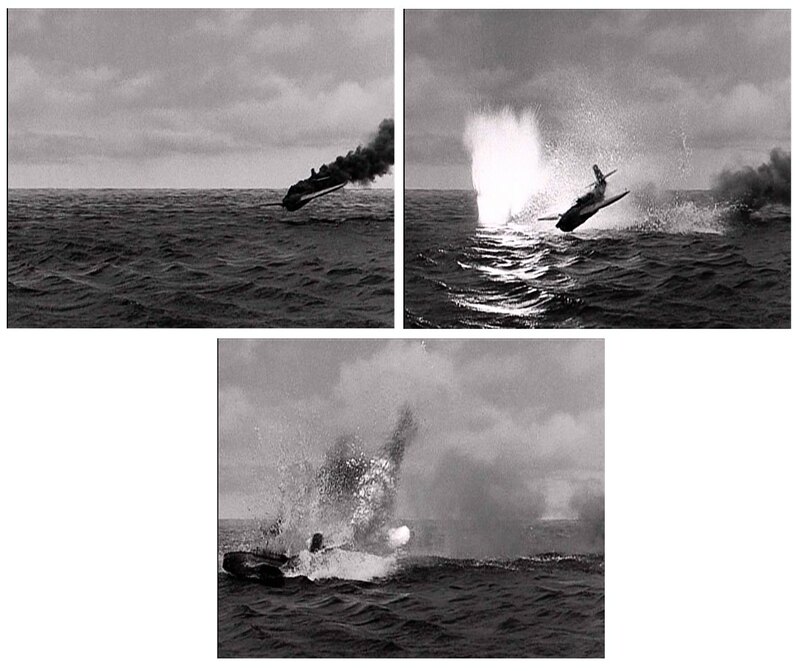 Really impressive, with even bunker explosions done using this method in some shots. More from D-DAY, THE SIXTH OF JUNE (1957). Ray Kellogg was photographic effects supervisor. Of course the most dazzling visual effect in this film would have to have been the exquisite Dana Wynter - as stunning a sight for the eyes as anyone....I think she passed away recently. While we're at war, I must include the excellent James Mason film about Rommel, THE DESERT FOX (1951). Many mattes and composites abound with these just being an example. A terrific film, and a rare one where both Sersen and Kellogg received co-effects screen credit. The unbelievably dry and tedious DESIREE (1954) was an opulent costumer about Napoleon, shot in CinemaScope, though my vhs grabs miss much of the grandeur. 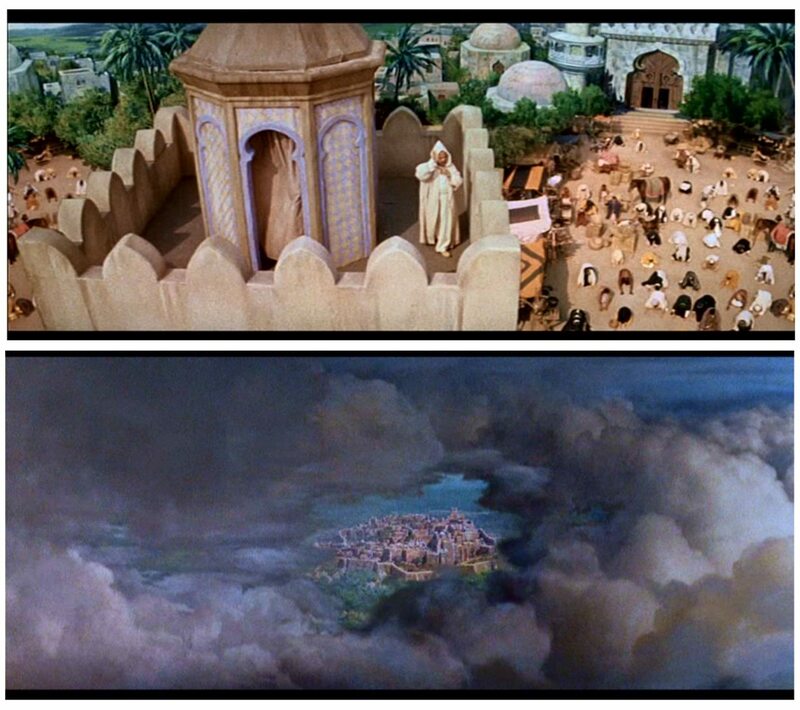 One of Fox's early forays into the CinemaScope side screen process was the energetic PRINCE VALIANT (1954) which also had many grand painted mattes. Matthew Yuricich recalled painting some of the mattes on this show, and also recalled the time somewhat later when he was ordered to scrape clean some of the glasses to allow re-use: "it made me feel sick" said Yuricich to author Craig Barron. 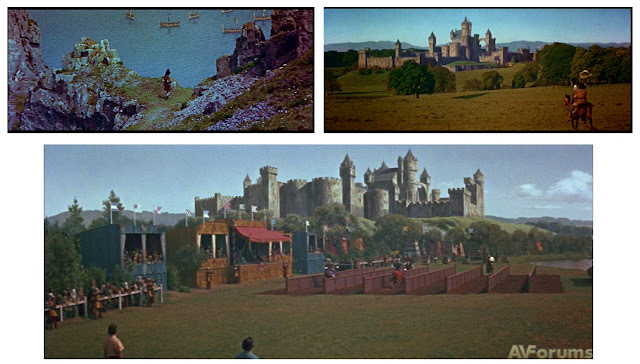 One more spectacular matte shot from PRINCE VALIANT. The popular 1958 Todd-AO extravaganza SOUTH PACIFIC featured some beautiful mattes of the mythical 'Bali-Hi'. As with some other mattes discussed here I was in contact with a US collector who supposedly had one of these in his garage, though for whatever reason he was unable to produce a photograph...sadly. In addition to the fabled 'Bali Hi' mattes, SOUTH PACIFIC also featured other less noticeable trick shots such as these depicting the US Navy off shore and squadrons of aircraft etc. I only saw this for the first time quite recently and was surprised at how much I liked it. Very catchy songs, and adorable female cast and stunning Emil Kosa cloudscapes. Great show. Bette Davis was extremely well cast in the under rated 1955 film THE VIRGIN QUEEN as Queen Elizabeth I. An excellent film that is too short by far, with many exquisite mattes and some totally credible miniatures to boot. THE VIRGIN QUEEN - quite possibly an entirely miniature set up here, or perhaps a combined shot? 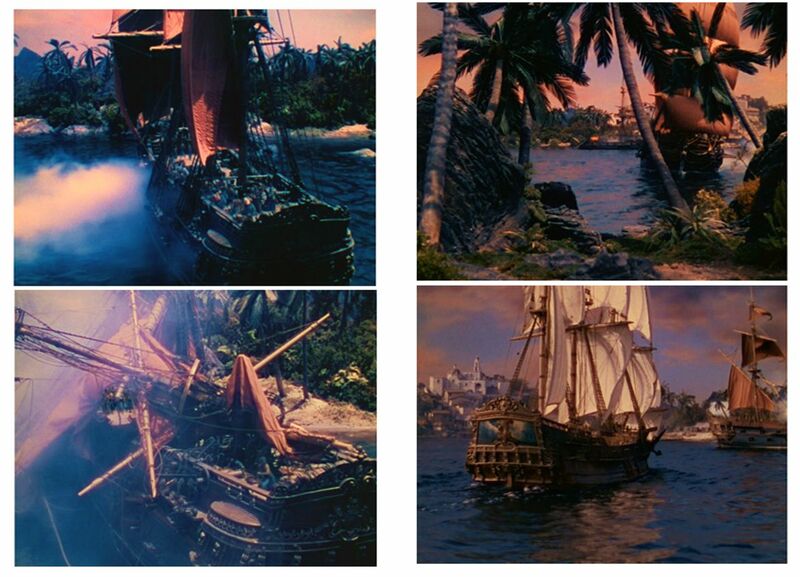 More from THE VIRGIN QUEEN - a film which suffered badly in old pan and scan tv prints. Ingrid Bergman's 1958 film INN OF THE SIXTH HAPPINESS may well have been a Fox release but I suspect that, as with others of that time, it was possibly a UK production, matte shots included. 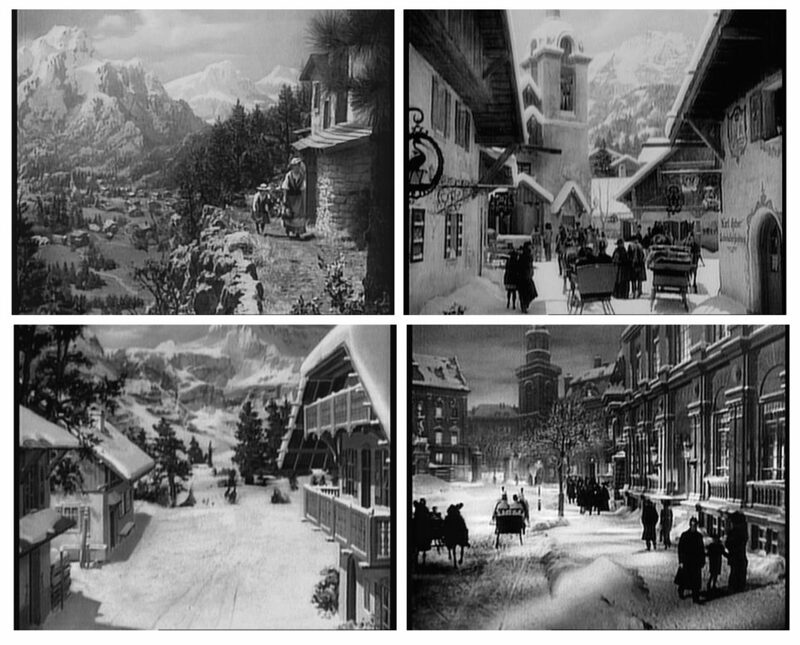 The upper left frame was a 'fix it' glass shot (I think it was done in camera) needed to conceal modern hydro electric pipes and to add a village. 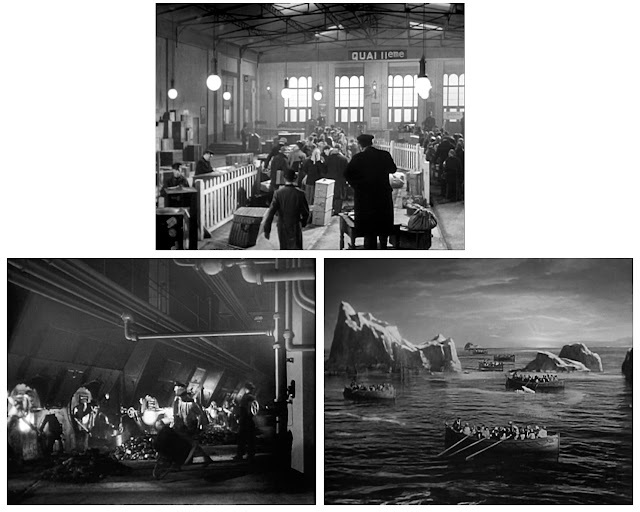 The mattes may have been carried out artists at either Shepperton, Pinewood or MGM-Elstree. 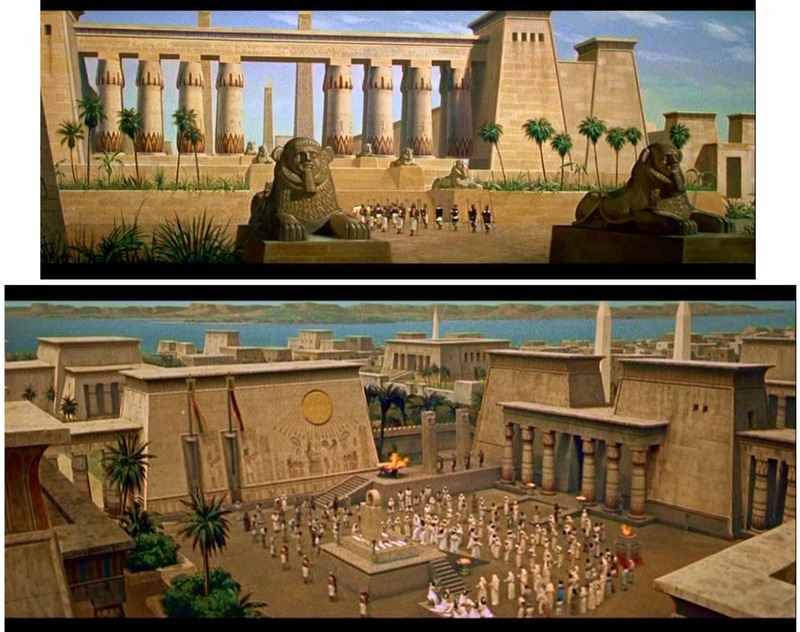 More mattes from THE EGYPTIAN. Two epic scale mattes which work well for THE EGYPTIAN. 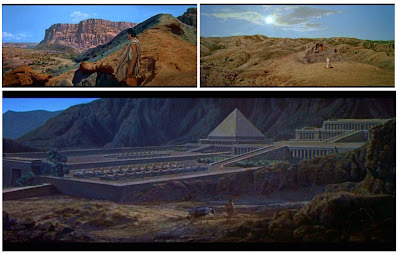 Again, THE EGYPTIAN - with Victor Mature doing his thing. 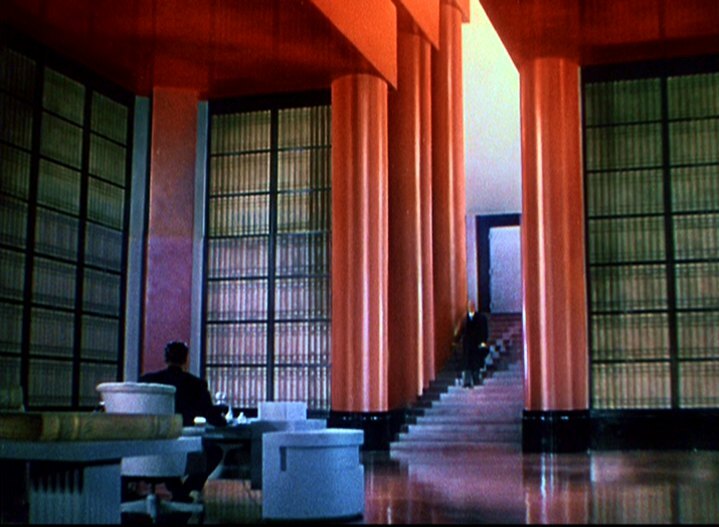 David O'Selznick's last film, A FAREWELL TO ARMS (1957) had some matte work in it such as this one of a WWII train station in Milan. I suspect that the effects work may have been done in the UK or at Cinecetta in Rome? Another excellent Fox psychological western, WARLOCK (1959) - the dream team of Fonda, Widmark and Quinn. The top matte opens the film while the other is a later scene, that upon close examination, Fonda and Quinn are barely on the safe side of the very subtle matte demarcation line, so obviously the painting was configured to fit the location plate. Another good, solid Fox WWII story, BETWEEN HEAVEN AND HELL (1956) takes the step through the matte line as Robert Wagner's helmet merges with the painted village in this shot. 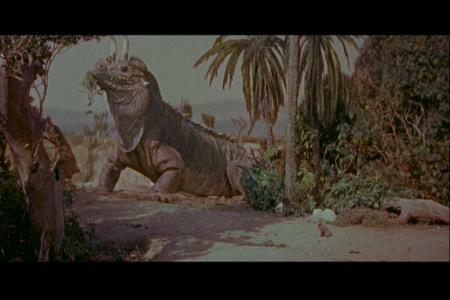 Irwin Allen's 1960 THE LOST WORLD was for the most part a laughable affair although I've not seen it in decades. 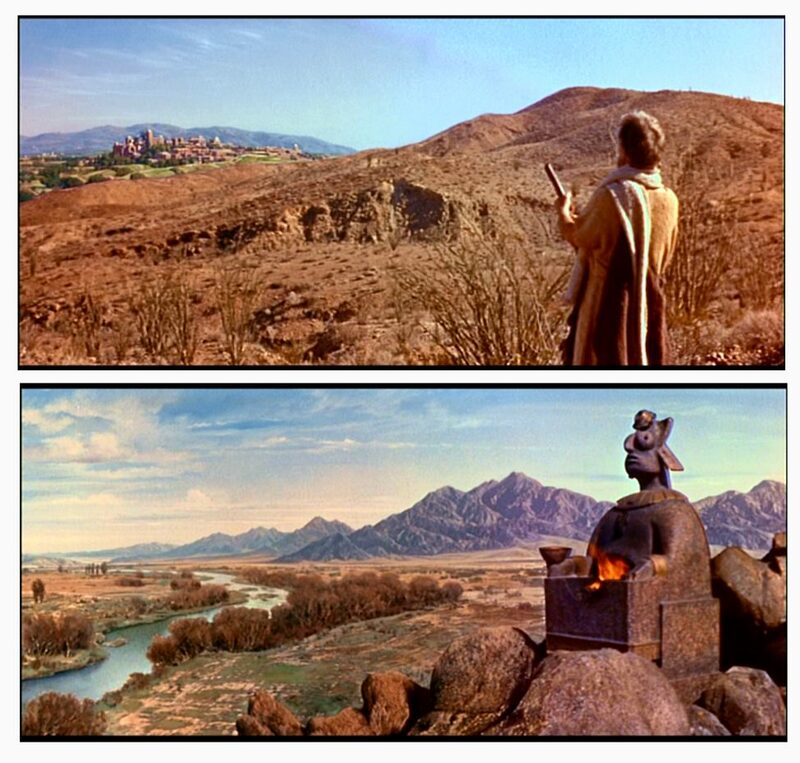 Another of Fox's biblical epics was the 1960 THE STORY OF RUTH. Irwin Allen again - and this time with the feature film of VOYAGE TO THE BOTTOM OF THE SEA (1961). The firey skies are multiple layered opticals of a flame thrower and represent the destruction of the Earth's Van Allan Belt. Another of Fox's British productions, 300 SPARTANS (1961) which I assume had UK based matte work. John Wayne's 1960 western NORTH TO ALASKA had a few mattes such as these and some optical effects work of the northern lights for some scenes. Irwin Allen would have a long association with Fox, with this lightweight adventure FIVE WEEKS IN A BALLOON (1962) being one such. A couple of nice mattes, decent blue screen work and some good miniature balloon footage. And here is that aforementioned balloon model sequence. 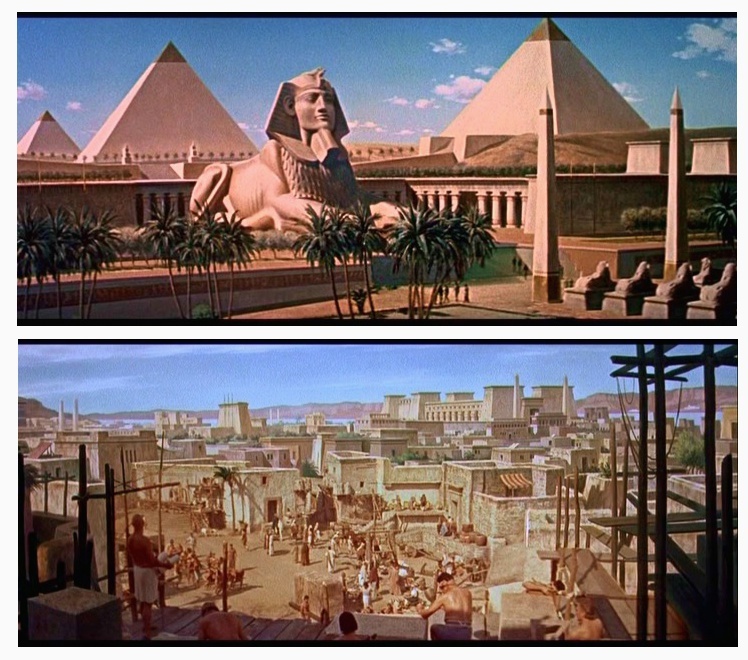 The mega budget flop that almost broke the camel's back, as it were - CLEOPATRA (1963). This magnificent shot is one of two in camera latent image foreground glass shots, with this view being that of the ancient port of Alexandria. Emil Kosa took home the Oscar for this, though I've read differing accounts of who actually painted it - from Fox veteran Ralph Hammeras, former Percy Day matte artist Joseph Natanson to landscape artist Mary Bone. The vast width of the pan necessitated two giant plates of glass, united with a frame which was hidden behind the center statue. Another wide panning glass shot from CLEOPATRA, with the join between the two angled glasses concealed by statue. Doris Day's 1965 comedy DO NOT DISTURB matte extension by Emil Kosa jr.
Steve McQueen - now there's an under appreciated actor folks - in THE SAND PEBBLES (1966) which featured two or three mattes by Emil Kosa including the Chinese city and most of the scenery and structures in the second shot. Fox television would call upon the L.B Abbott effects unit often, especially with their numerous Irwin Allen series. 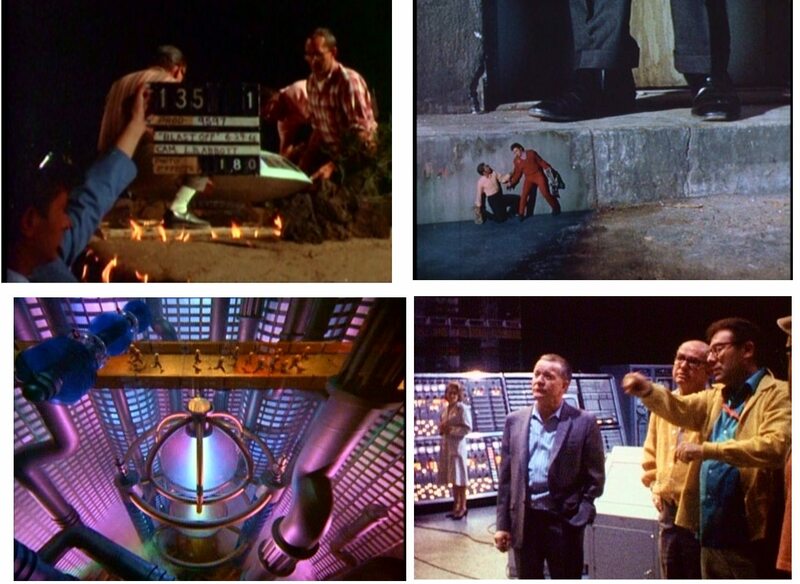 I intend to do a one off special on Irwin Allen's effects shows in a later blog. Top: LOST IN SPACE, LAND OF THE GIANTS. 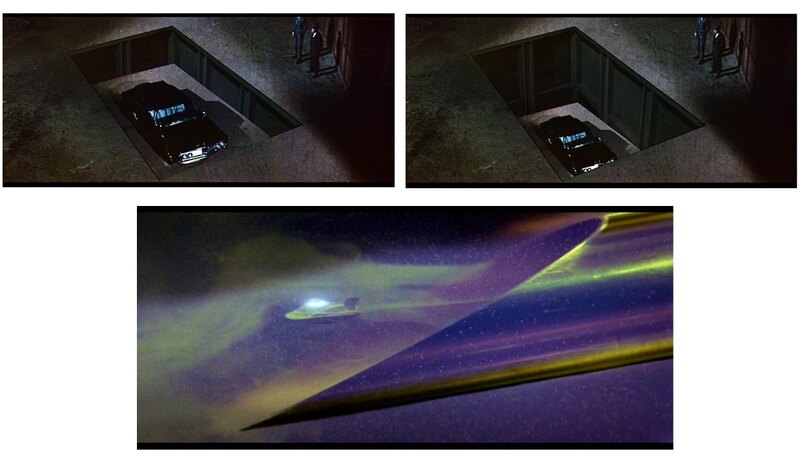 Bottom: THE TIME TUNNEL. That's Bill Abbott standing in middle. A credit listing so familiar to all of us film buffs who grew up in the 60's. With the complex effects showcase that was to be FANTASTIC VOYAGE in 1966, effects head Bill Abbott found himself to be swamped with work and needed a right hand man. Art Cruickshank in Bill's own words "filled the bill" and joined Fox after a very long career already at Disney, and stayed with Abbott until the department was wound up in the early 70's. The top frames use Kosa matte art to simulate a deep liftshaft, while the other frame is a painted hypodermic needle with the miniaturised Proteus doubled in. Despite some bleed through in some of the vast number of blue screen shots, the overall effects work is great for the time. The Frank Sinatra WWII story VON RYAN'S EXPRESS (1965) made full use of the Fox effects department, with some painted mattes, some miniatures alot of pyrotechnics and this sensational little piece where the director wanted to show the smoke trails from air to ground missiles. Bill Abbott wrote about this effect in his wonderful book whereby he enlisted the talents of veteran matte painter Menrad von Muldorfer, who as well as being a top flight matte artist was also an accomplished cell animator. These 4 or 5 cuts took months to hand animate, with the aerial POV gags being the most problematic as the plate was free and not locked down. The effect looks sensational to those of us who love old time cell animated gags. A matte composite from the finale of VON RYAN'S EXPRESS. Again, terrific shots from OUR MAN FLINT. I could never figure these out - partial miniature, paint and live action it seems, but just where one ends and the other begins I'm unsure. Sensational stuff. 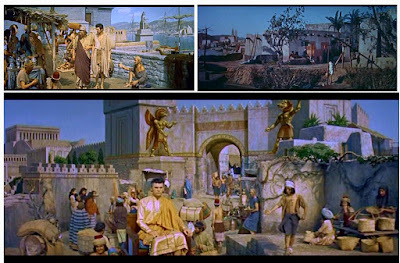 Fox were big time with biblical type epics and this Charlton Heston entry THE AGONY AND THE ECSTACY (1965) highlighted alot of nice effects work. By this time, long time Paramount matte artist Jan Domela had moved on following the closure of the effects unit in the early 60's and was painting for a variety of other studios, Fox included. This is one of Domela's several uncredited mattes for this film, painted under Emil Kosa. Two more Jan Domela mattes depicting stages of the construction of the Sistine Chapel. Dino DeLaurentiis' critically thrashed film THE BIBLE (1966) had a few mattes, but not as I understand it carried out at Fox. I think they were possibly done in Europe as the production was based there. Fox had it's share of box office flops and DR DOLITTLE (1967) was no exception. An altogether abysmal film with very little to recommend it. The fact that it picked up the visual effects Oscar (up against Al Whitlock for TOBRUCK) leaves one speechless. 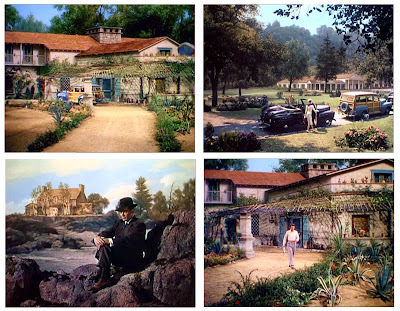 Frank Sinatra's THE DETECTIVE (1968) had a painted seaside vista added to the foreground house. Now, time for one of my all time favourite films - a film which has not lost it's edge one bit over the past 40 plus years. 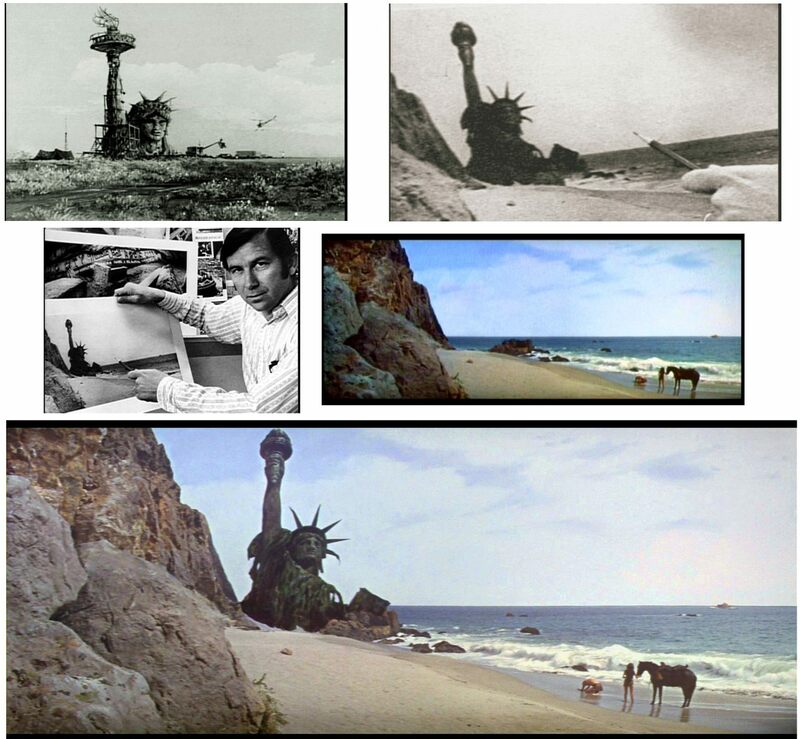 PLANET OF THE APES (1968). A brilliant script by Rod Serling builds upon an already years ahead of it's time novella by Pierre Boulle in a remarkable and unforgettable film. Not heavy in visual effects, but perhaps more trick shots than one may have realised. 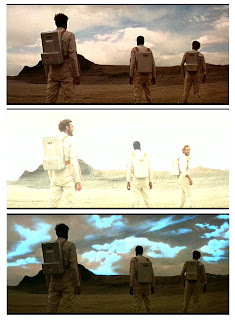 These opening shots of stellar bodies as seen from Taylor's command module have always tantalised me since I was a kid. Not your usual starscape by any means, but more of a constantly shifting, swirling mass of stars and meteors, all simply achieved yet so effective. 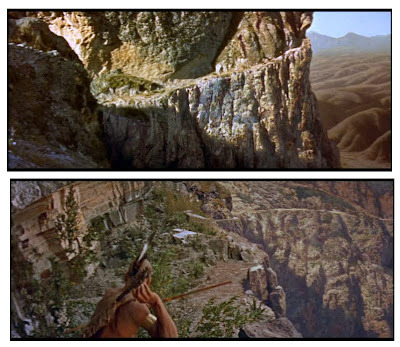 Although the PLANET OF THE APES dvd audio commentary states this to be a matte painting, I tend to more think of it as a painted backing in a miniature tank shot. Impeccably written and cast, APES is a winner all the way and is light years ahead of that abysmal Tim Burton 'reimagining' of recent times, with not even the always excellent Paul Giamatti being able to save the proceedings! 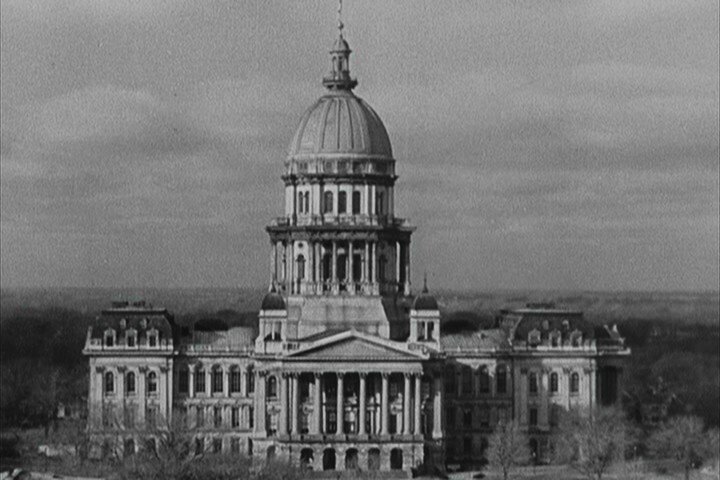 The shot here is one of the opticals featured during the first 30 minutes with strange skies and atmospherics courtesy of L.B Abbott. 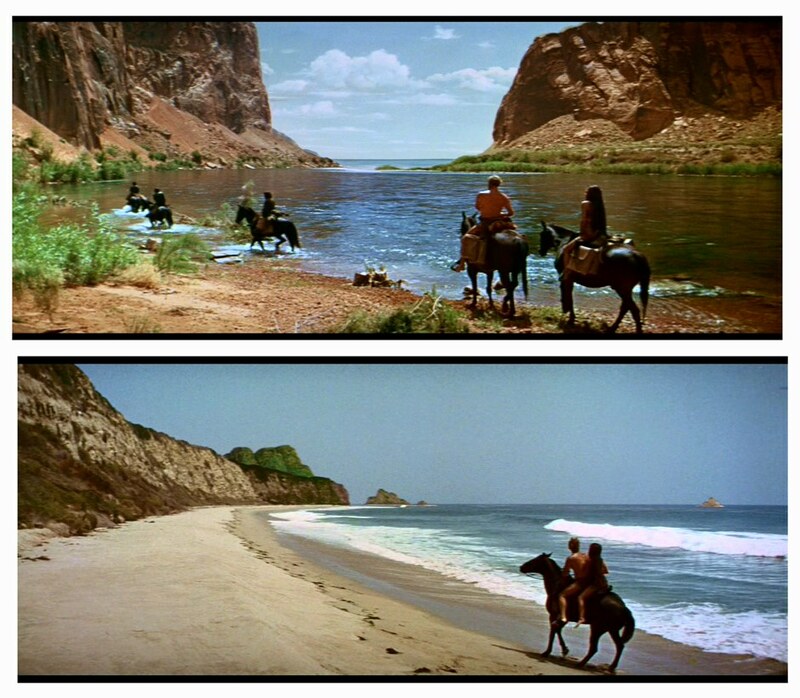 Two matte painted shots which tend to elude many viewers from PLANET OF THE APES. 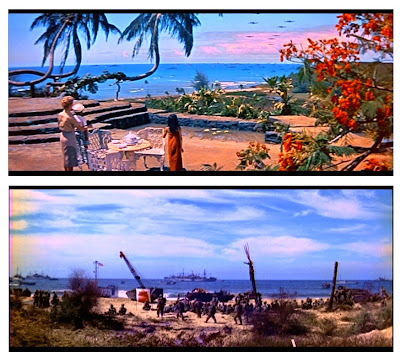 The top frame has had a new painted sky and ocean added to an otherwise landlocked location, while the lower frame occurs just before the climax where the beach has been extended, and possibly modern structures eliminated by Emil Kosa. One of the most famous and iconic matte shots in movie history, and one that Kosa will always be remembered for, as he died shortly after this film was finished. 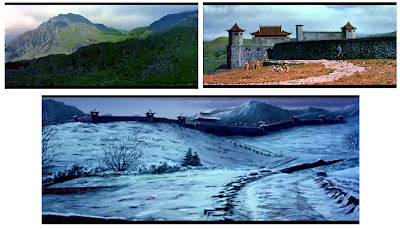 At top left is the original art directors conceptual drawing of the big reveal, with other photos showing the original location plate and William Creber with the final effect composite. The one failing of this shot is the awful, grainy, 'mechanised' optical printer zoom out which mars the effect considerably. 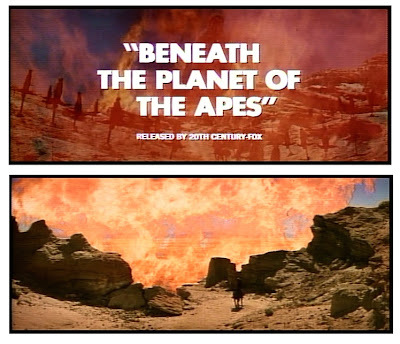 The immediate sequel BENEATH THE PLANET OF THE APES (1969) was loaded with visual effects shots and some of the most gruesome make up effects ever seen in a kids movie EVER!! John Chambers not only supplied the simian appliances but also the truly nightmarish radiation scarred mutant make ups. Once again L.B Abbott and Art Cruickshank were helming the photographic effects, with an uncredited Matthew Yuricich on matte painting. Memorable photographic effects sequence from BENEATH THE PLANET OF THE APES which I've always liked. Post apocalyptic New York city from BENEATH THE PLANET OF THE APES, courtesy of Matthew Yuricich. 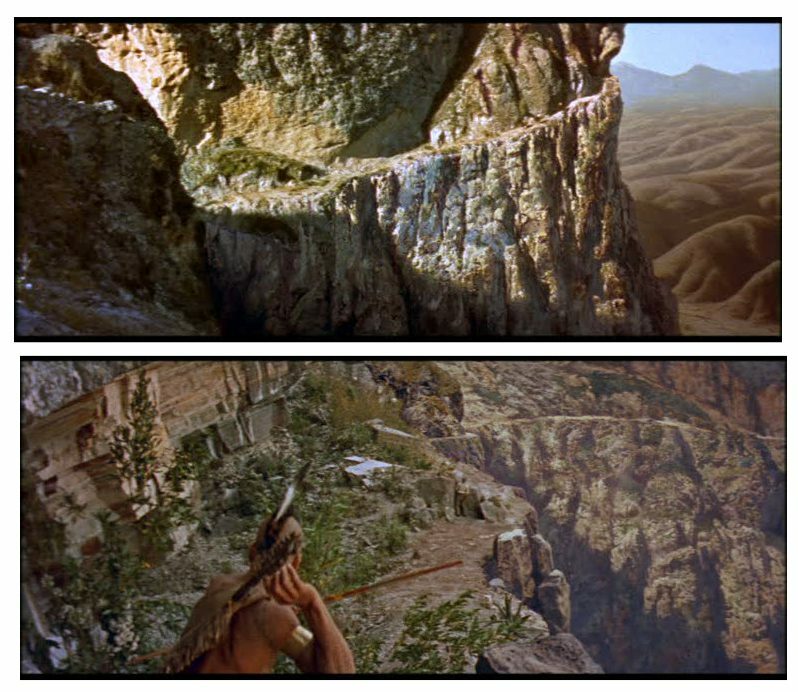 More of Yuricich's APES matte shots. 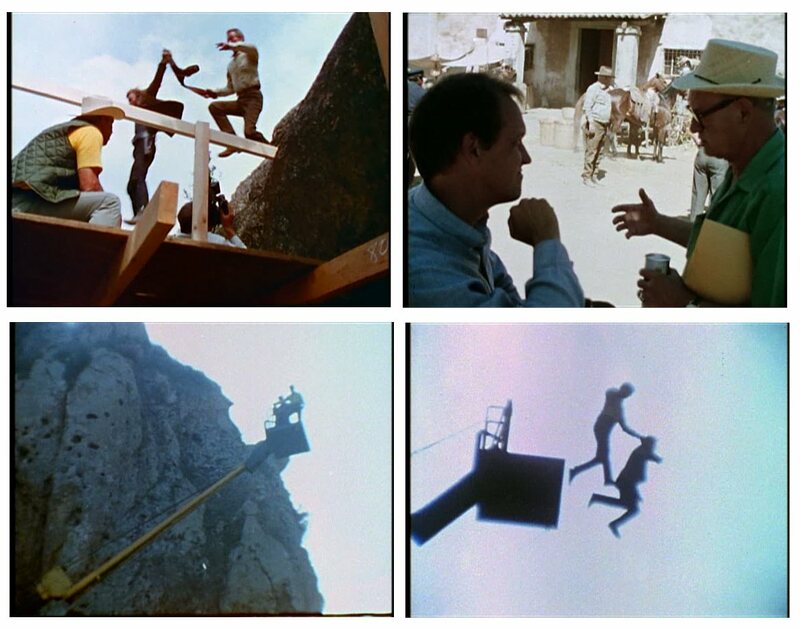 Stars Paul Newman and Robert Redford perform a small 3 foot leap with utmost safety while the two BUTCH CASSIDY stuntmen do the real deal from a very high platform. The final in camera composite with foreground glass art merging perfectly and invisibly with the action. 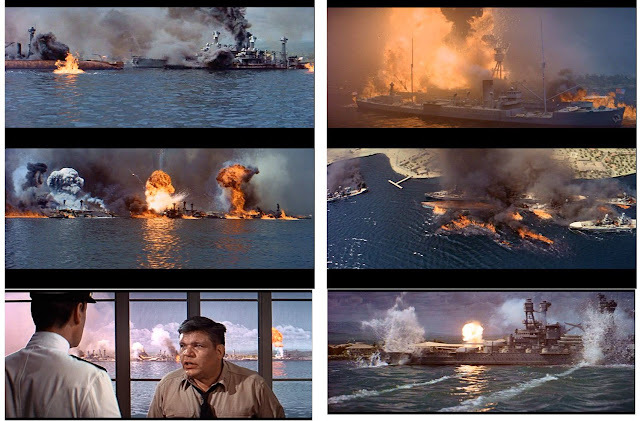 Fox poured all their resourses into the huge, and outstanding TORA, TORA, TORA (1970) with many utterly deserving Oscar winning special effects by Bill Abbott and A.D Flowers, This frame is I think the only matte painting in the show, a Matthew Yuricich rendering of Pearl Harbour. 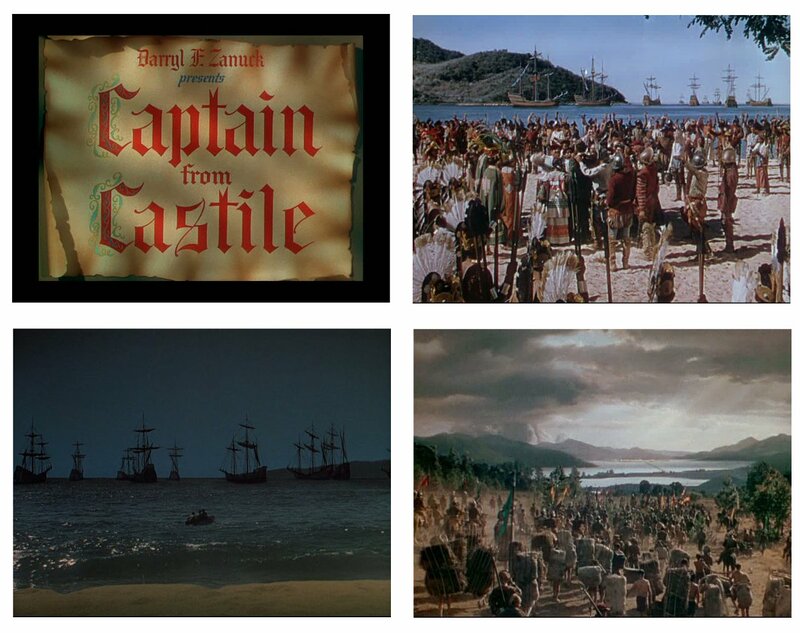 Incredible miniatures by Ivan Martin and Gael Brown, shot by Bill Abbott with mechanical effects by A.D Flowers, and as good as the miniatures were, they really played second fiddle to Flowers' jaw dropping full scale mechanical effects - some of the best ever achieved for the genre. The miniatures tank on the Fox ranch during the TORA effects shoot. 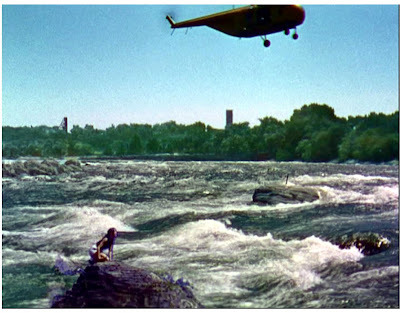 Irwin Allen's 1972 mega bonanza THE POSEIDEN ADVENTURE virtually saved Fox overnight, despite what the critics said. Lots of full size physical effects and miniatures, plus this sole Matthew Yuricich matte painting won the Oscar. I'm not sure whether the in house effects department was still functioning by now, with, in all likelihood effects work as well as all other technical jobs being farmed out to contractors on a film by film basis. As if the thundering success of POSEIDEN wasn't enough (I'm one who firmly believes that if you've got enough to get by with, leave it at that!) 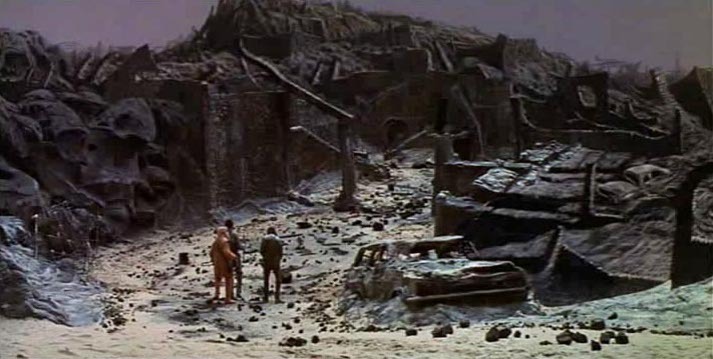 Irwin Allen hammered out yet another blockbuster, THE TOWERING INFERNO (1974) - and one hell of a show if was too. Terrific cast, excellent effects work throughout and damned exciting from start to finish. Here's the huge 110 foot model in the now emptied out Sersen tank at the Fox ranch, with Bill Abbott manning the camera. 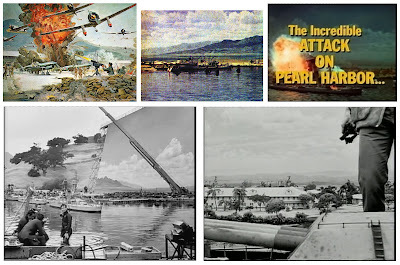 Once again A.D FLOWERS handled all physical effects as he did with TORA, PATTON, POSEIDEN and others. 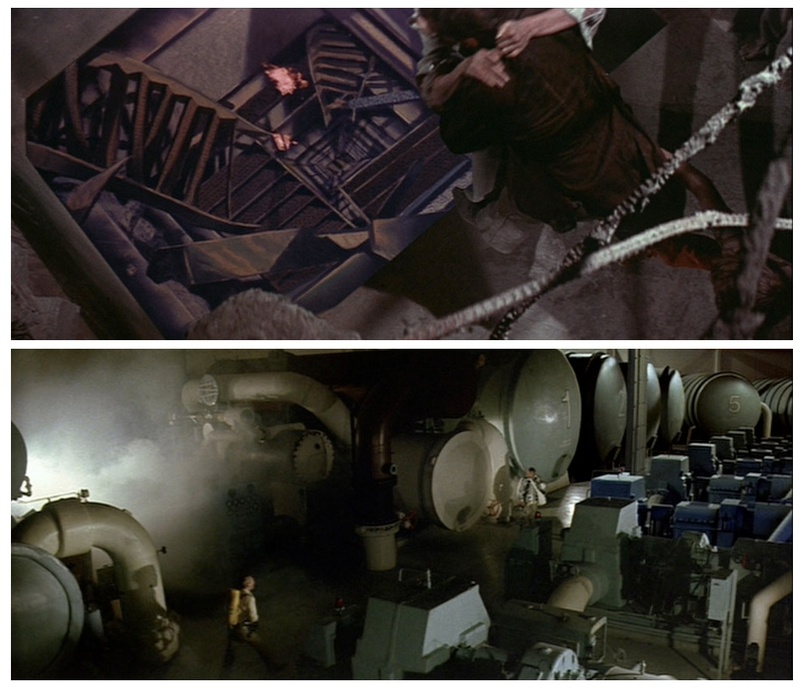 The first vfx shot in THE TOWERING INFERNO (1974) is this stunning reveal as a flawless Matthew Yuricich matte painting that ties in perfectly with the actual cityscape. The shot is sold by the inclusion of a real time helicopter which flies across frame and is momentarily rotoscoped to fly in front of Yuricich's skyscraper(s)... to perfection. 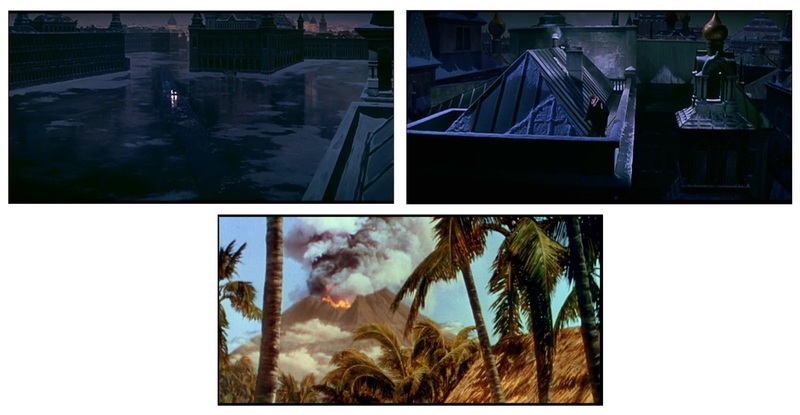 Further Yuricich matte shots from THE TOWERING INFERNO with some being quite low key and un noticeable. 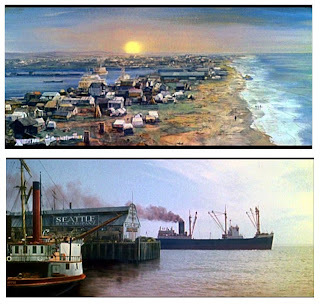 The fourth APES film CONQUEST OF THE PLANET OF THE APES (1973) had a cheap look about it which not even this Yuricich painting and a later miniature split screen could disguise. The fifth and final APES film, BATTLE FOR THE PLANET OF THE APES (1974) again utilised the services of Matthew Yuricich and his post apocalyptic paintbrush. 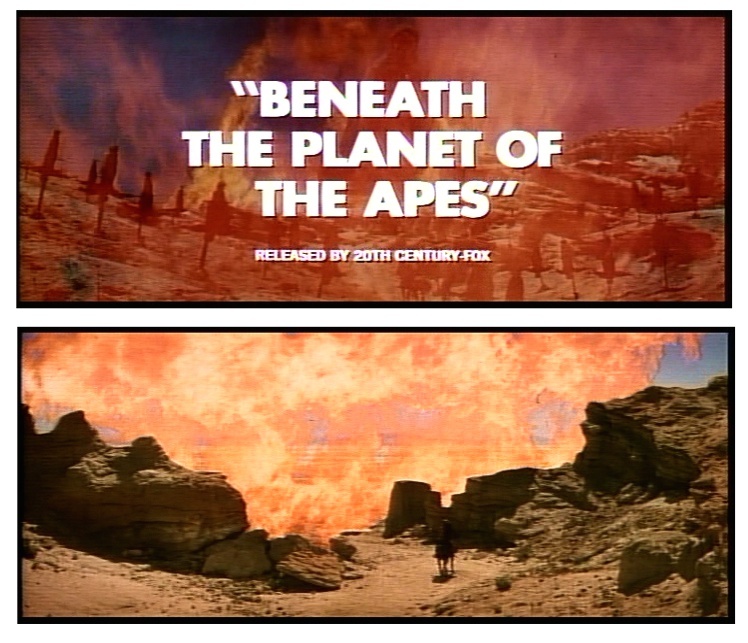 The second of two BATTLE FOR THE PLANET OF THE APES mattes. 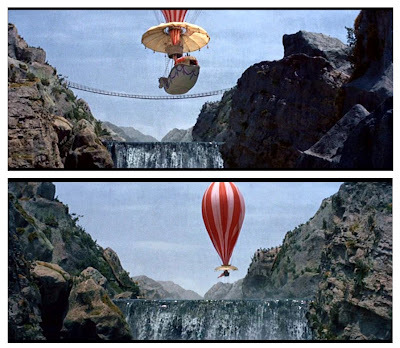 Although Fox had long since halted it's own in house special effects department the odd Fox film cropped up which required matte shots such as this one, the wonderful Gene Wilder comedy SILVER STREAK (1976). 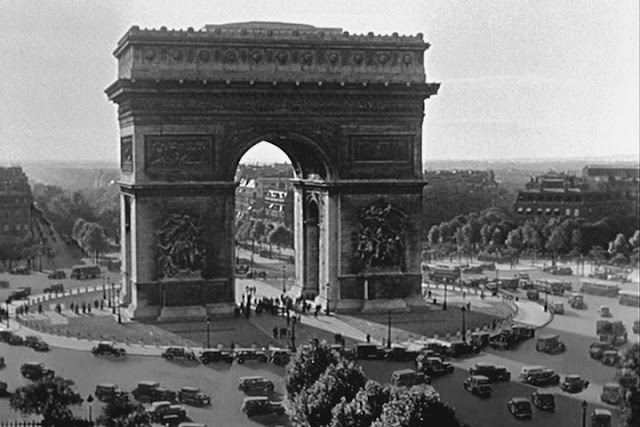 This matte was actually painted by Louis Litchtenfield and composited by former Fox optical cameraman Frank Van Der Veer at his own independent operation Van Der Veer Photo Effects. 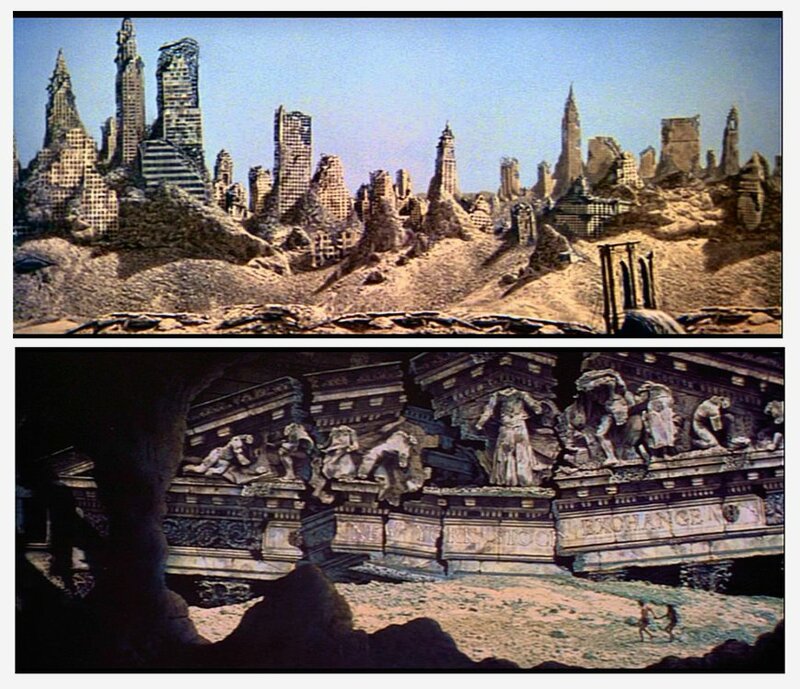 Another outside job, and this for DAMNATION ALLEY (1977) whereby Matthew Yuricich painted more post apocalyptic views, this time of Las Vegas. Some of the mattes were actually oil paint touch ups over the top of large photo blow ups, a technique Yuricich had learned from Lee LeBlanc at MGM in the fifties. 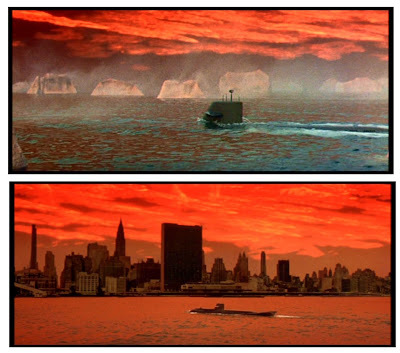 Budding artist Rocco Gioffre mentioned once how when he was doing his apprenticeship with Matthew in the matte room on CE3K for Columbia and the pair of them would be secretly working on the Fox DAMNATION ALLEY paintings when Doug Trumbull wasn't around! Fox had long since shut up it's effects shop by the time George Lucas's STAR WARS came along. 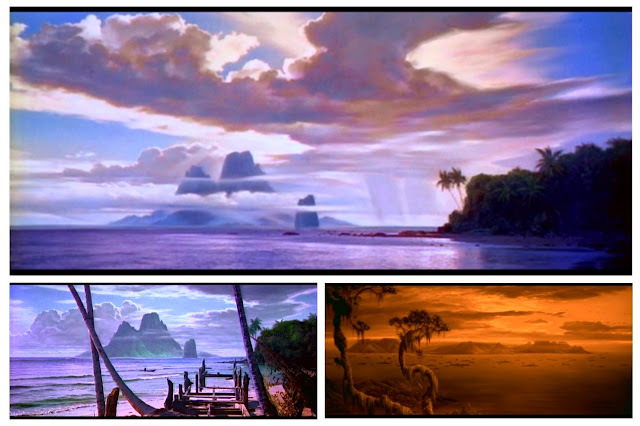 As we're all aware Lucas set up his own specialty effects house, ILM to handle all effects... well not quite all as they were not equipped for matte painting, so all of that side was subcontracted out to Harrison Ellenshaw over at Disney. 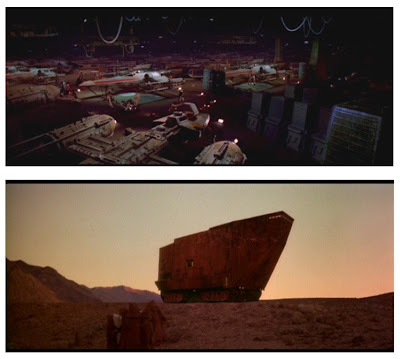 By the time EMPIRE STRIKES BACK came around in 1979 ILM had it's own in house matte painting division, headed by Harrison Ellenshaw with Ralph McQuarrie and Mike Pangrazio on staff. Ralph McQuarrie at work on one of his EMPIRE STRIKES BACK mattes. Lastly, here's an ILM matte from Fox's RETURN OF THE JEDI (1983) which, as with the previous 2 films I've simply included here as a means to illustrate the timeline and the shift to alternate means to supply an fx shot to Fox films. 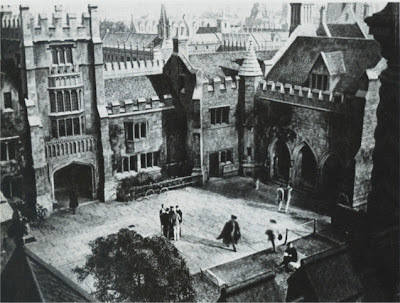 COMING UP SOON - WALTER PERCY DAY: MERCHANT OF MAGIC. where studios such as Metro went all out creating vast numbers of cinematic scenes and shots through the very SPECIAL EFFECTS Things dropped off considerably in the following decade with the numbers of matte shots reducing steadily due to a more location based sensibility rather than relying on the studio artisans to create the mood. I couldn't agree with you more. Not only did they drop off in number but also in quality. 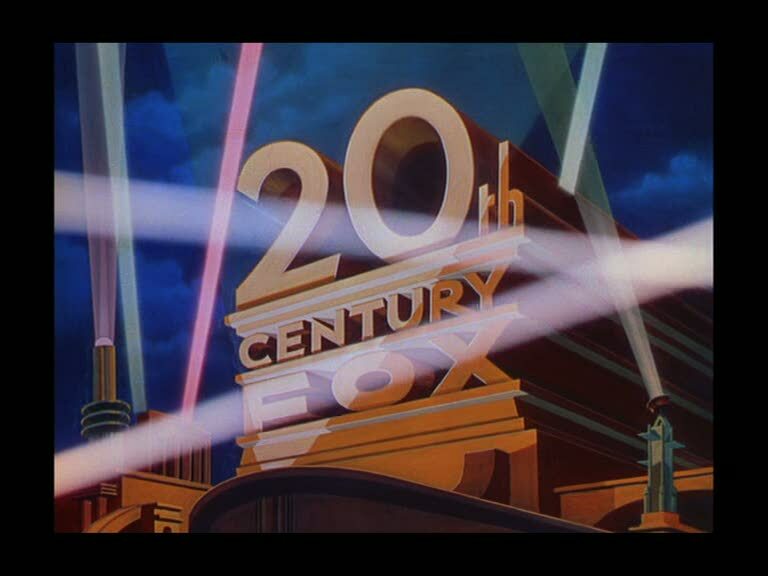 Just compare any number of 40's mattes from Fox, Warners or MGM to the same studios the next decade and beyond. I hesitate to say this, as I suspect that you've forgotten more about movies than I'll ever know, but the still you caption as "Just Imagine" is actually from a 1929 British movie called "High Treason". 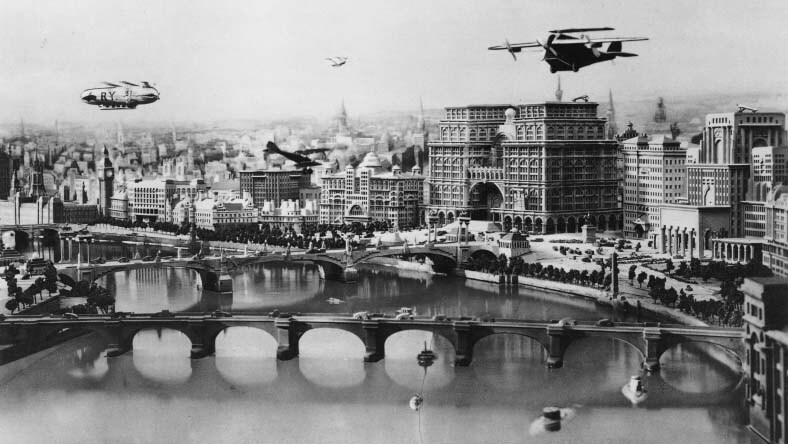 That's London in 1950, by the way. Many of us remember it as looking exactly like that. You're without much doubt, on the money there, as I've not seen JUST IMAGINE, not heard of HIGH TREASON - but had the photo incorrectly labelled. Hi - I just discovered your blog (while doing a Google image search for Peter Ellenshaw). WOW! Amazing. 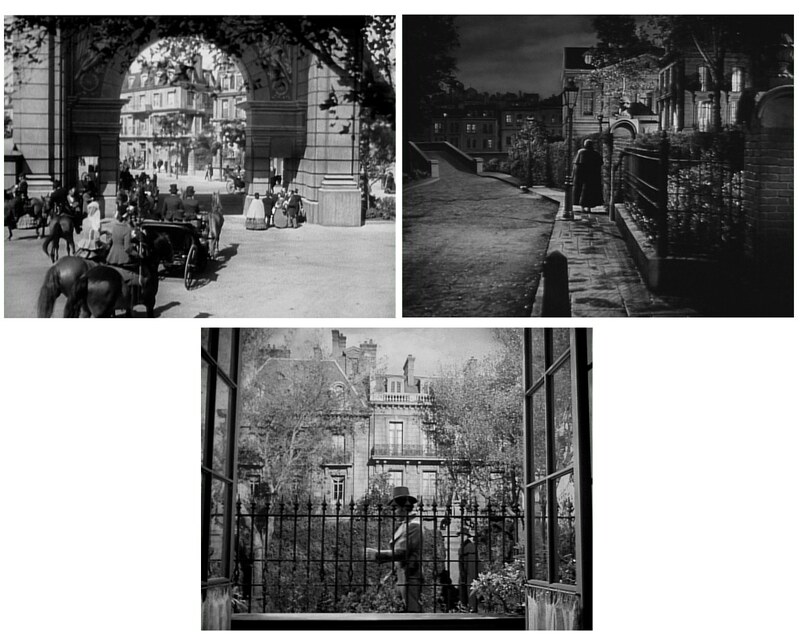 I've always been fascinated by the art of the matte shot, and your blog is an unbelievable showcase of historic special effects images. THANKS! Plenty more Ellenshaw here waiting to go 'on line' with virtually all of his films covered. 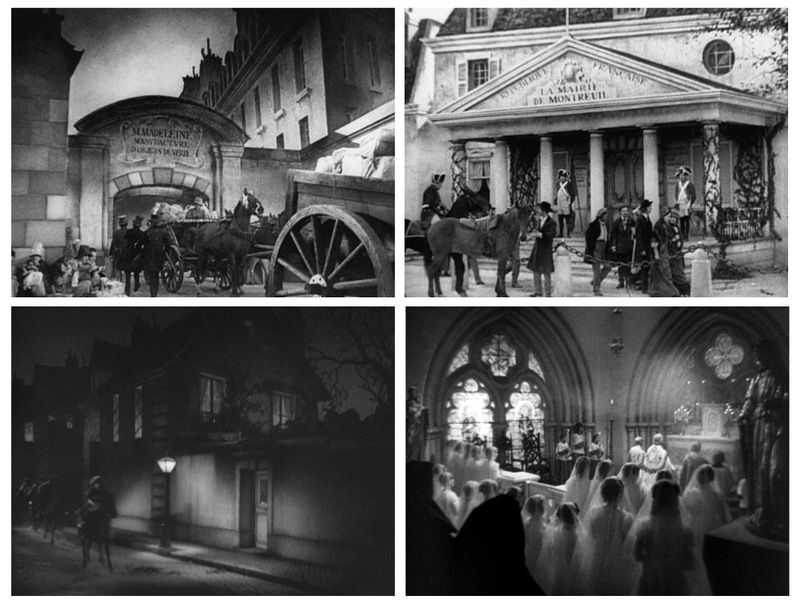 Special blogs to come on all the mattes from his British films and more!! You have posted several pictures and/or references to me. I wish to correct the spelling of my name. It is NOT Robert SkotaCk. It is Robert SKOTAK. There is no "c" in Skotak. Ok? Thanks. Sorry about that spelling mishap. At great risk of losing large chunks of blog article whenever I 'edit', I've corrected those as best I can. Incidentally, Screen Archives has produced a limited run of the restored The Egyptian on blu ray. Thank you for this incredible historic perspective of a mostly lost art form. Glad that it will not totally be lost thanks to people like who have taken the time to document and preserve this information. Re: "Lifeboat": The real star of that show was process cameraman Edwin Hammeras - and he wasn't even credited. His daughter, Janet Walsh, wrote in a mail: "The biggest story of my Dad's life was when Lifeboat was being made. Tallulah Bankhead was the star, and gave Dad a beautiful gold money clip engraved with her signature when it was over. 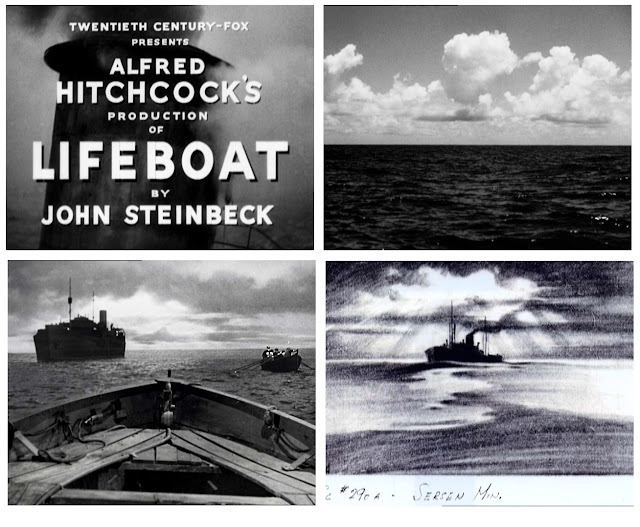 All of the scenes in the lifeboat were shot by Dad, and that was about 95% of the film. It was sad for him and for his family that they refused to give him credit on the screen for it. There was an official 'Director of Photography' that was credited, but he didn't do much of the work." Fascinating story and one we'd probably never ever know about if had you not shared that information. All the best for the Xmas season. Any fan of Bernard Herrmann's is a friend of mine...(which you obviously are!)!! Oh brother, I could talk for hours on Herrmann (and other movie composers I like).... Bernie was a one of a kind for me, especially with his use of the woodwind section in his scores which are a joy to the auditory canal. His final section at the very end of the closing credits of TAXI DRIVER (his last work) are amongst the most chilling film score 'pieces' ever conceived and give me goosebumps. 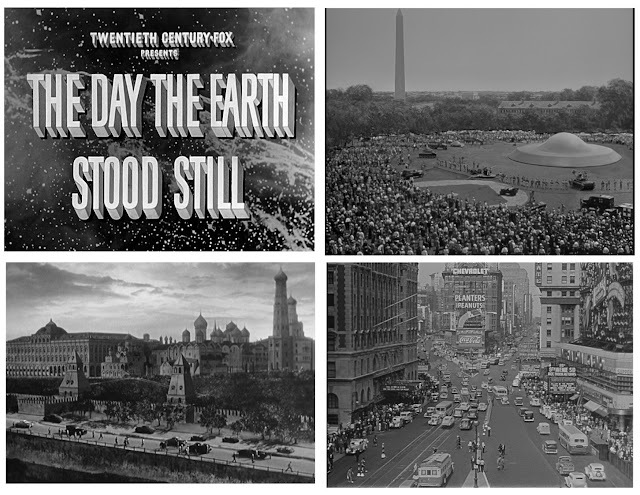 Herrmann's DAY THE EARTH STOOD STILL theme ranks as a masterpiece, which too gives me goosebumps in it's unusual ethereal structure. A personal fave of the non-goosebump inducing variety has got to be the exquisite 'Sleighride' from DEVIL AND DANIEL WEBSTER which sadly is fragmented to just a snippet in the actual film, but his full piece is an utter joy to behold. On scene film making. i have many letters of awards. Most impressive is the color paintings of scenes from 200000 leagues under the sea. This is indeed very interesting, and naturally I would be very enthusiastic to see whatever material you would care to share with me. I wonder whether this is the same scrapbook which Don Shay had access to back in the 60's, some of which formed the basis of his excellent article on Ralph in an early Cinefex issue. I eagerly look forward to hearing from you Gregg. Material. What i have is 3 scrapbooks. 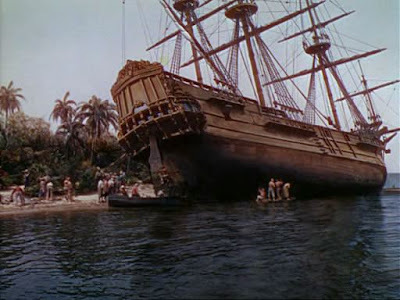 The large one is original studio paintings of 200000 leauges under the sea along with original photos and materials used to create the movie. The other 2 scrapbooks date to the 30's and contain mostly original phots of the guys, letters from people in high places such as Walt Disney and so on. many awards. X/mas cards also collections of autographs. There are 100's of items all relating to Hammerst. I also have some personal letters that are extremely interesting. It has been fun. 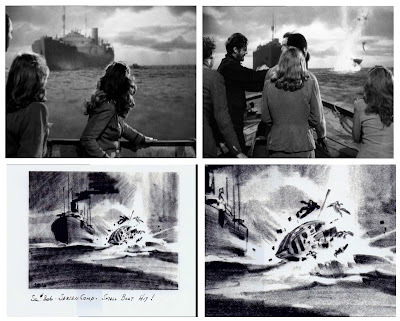 I have original color paintings used to make the movie 200000 leagues under the sea. I didn't receive any email from you.....maybe something is amiss?? Looking forward to seeing the material.